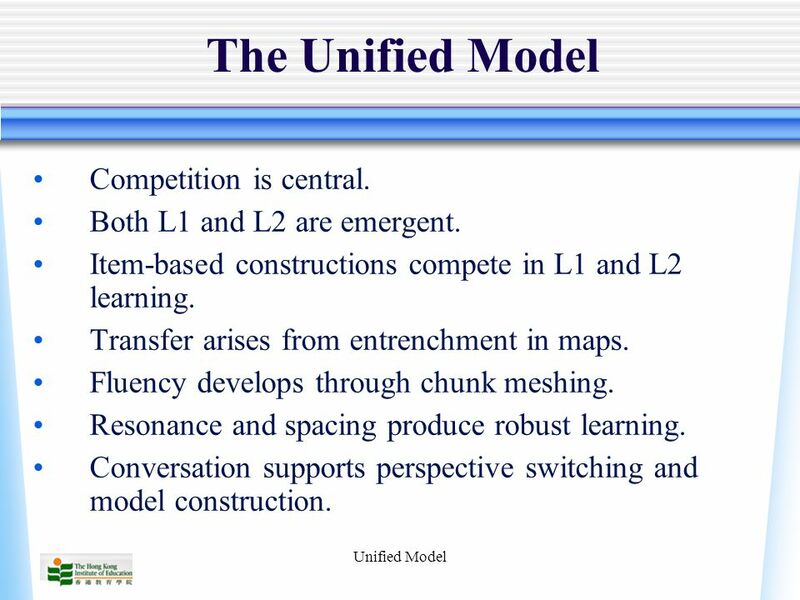 Unified Model A Unified Model for L1 and L2 Brian MacWhinney HKIEd, Carnegie Mellon. 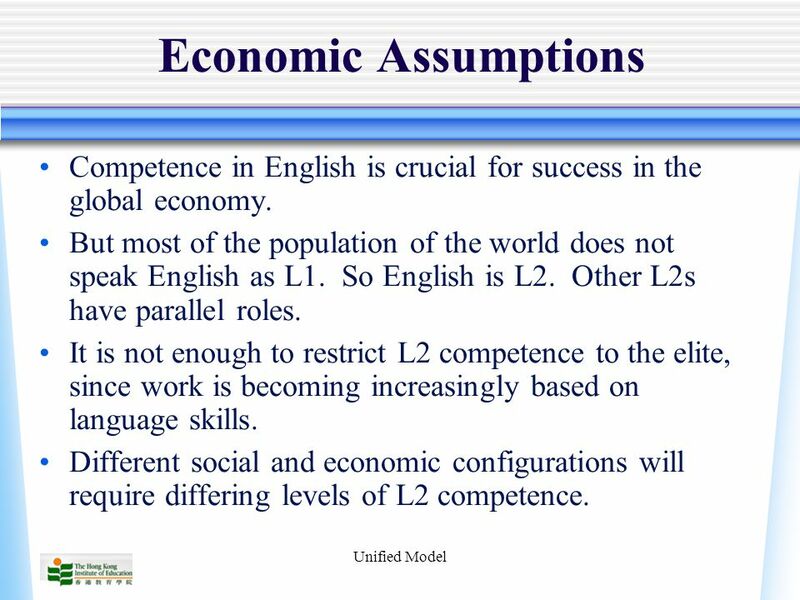 3 Unified Model Economic Assumptions Competence in English is crucial for success in the global economy. 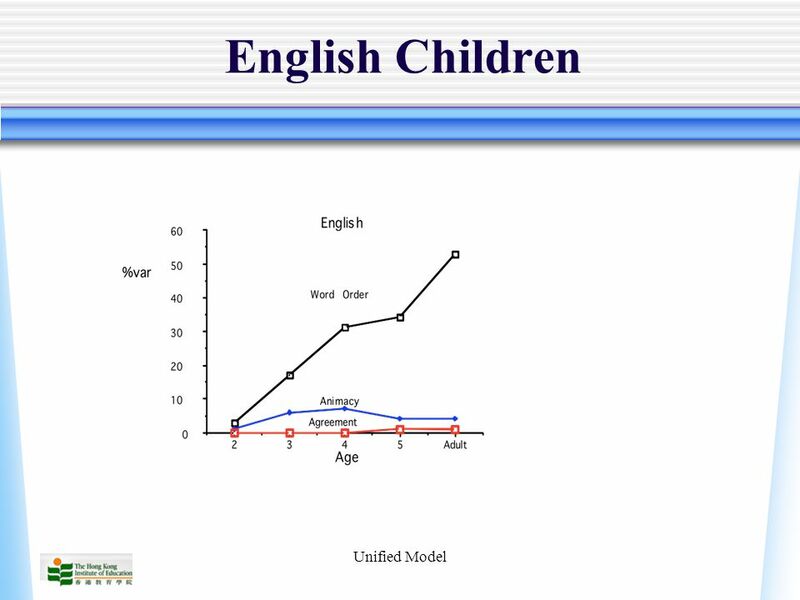 But most of the population of the world does not speak English as L1. 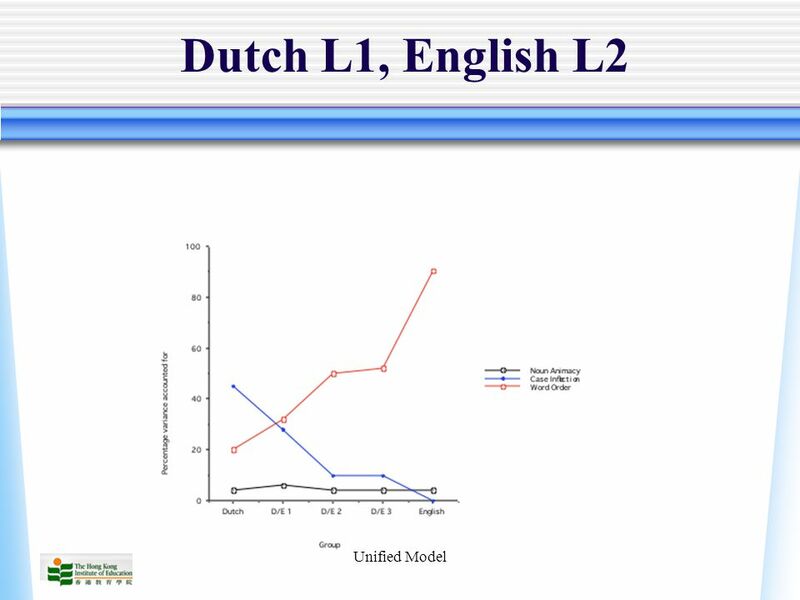 So English is L2. 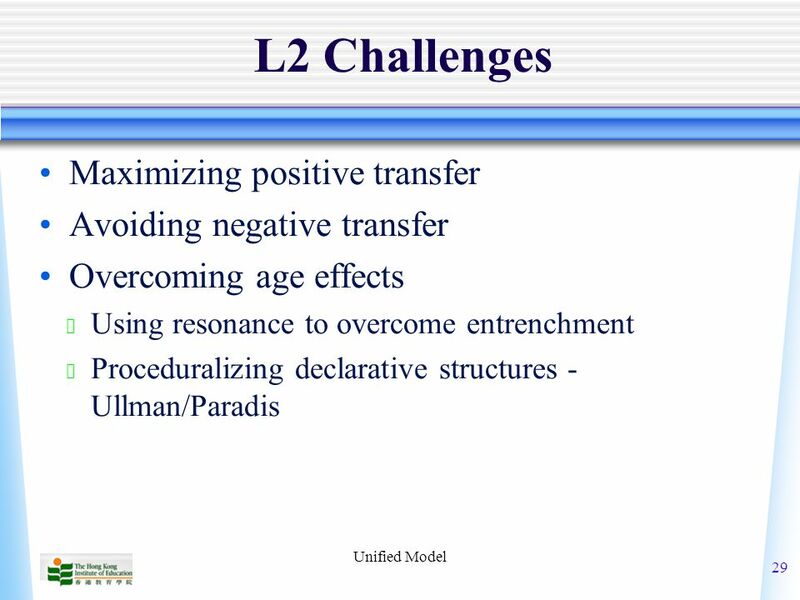 Other L2s have parallel roles. 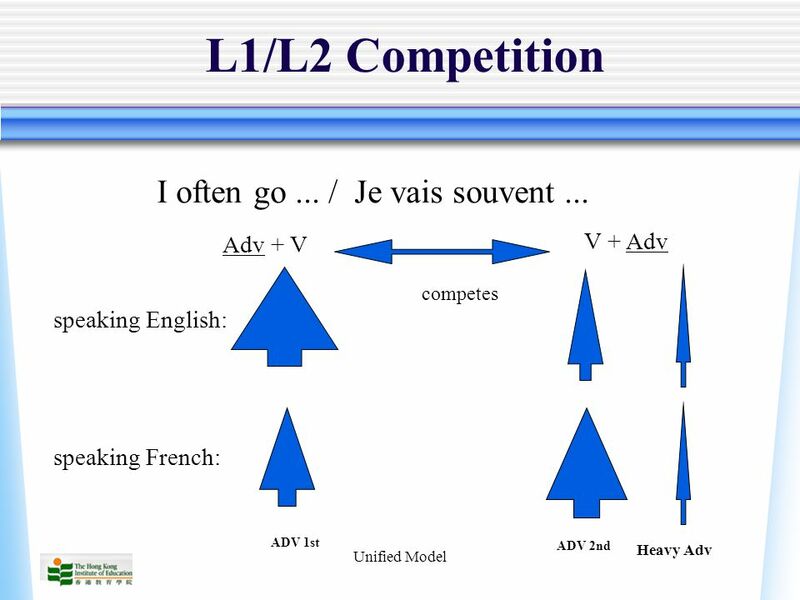 It is not enough to restrict L2 competence to the elite, since work is becoming increasingly based on language skills. 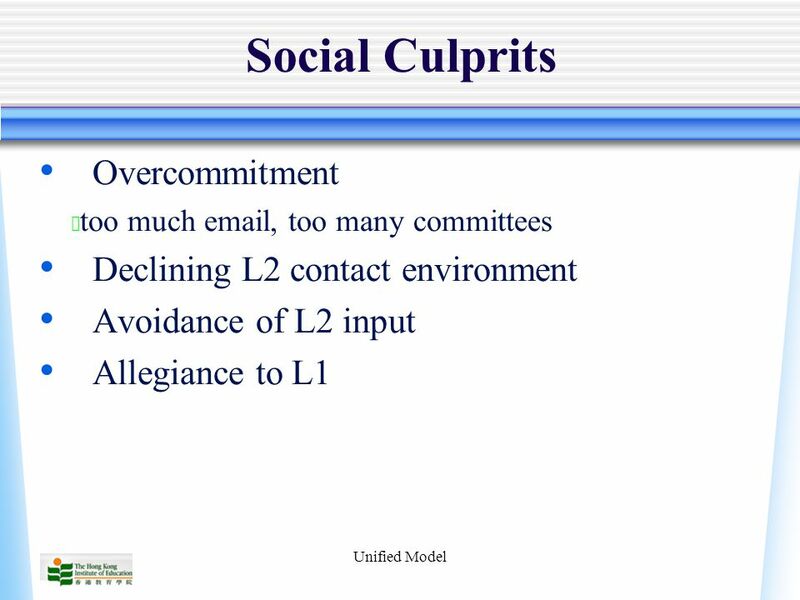 Different social and economic configurations will require differing levels of L2 competence. 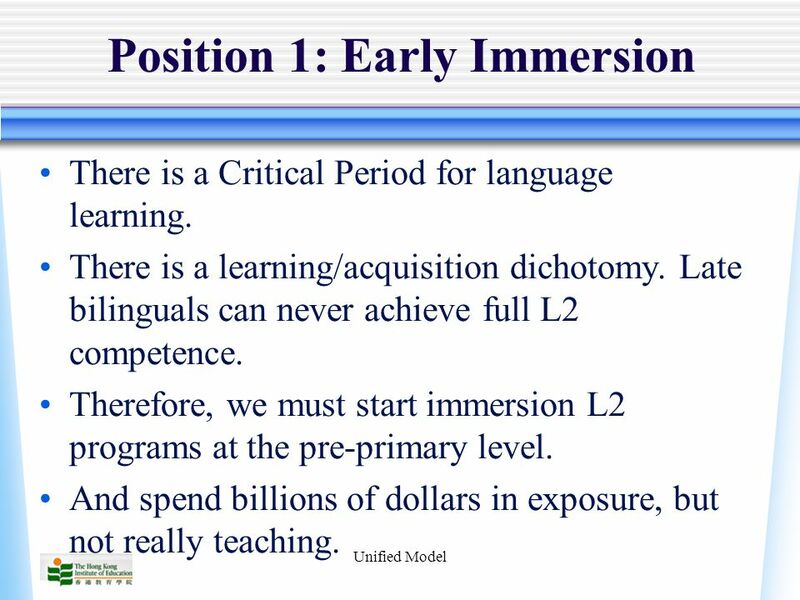 4 Unified Model Position 1: Early Immersion There is a Critical Period for language learning. 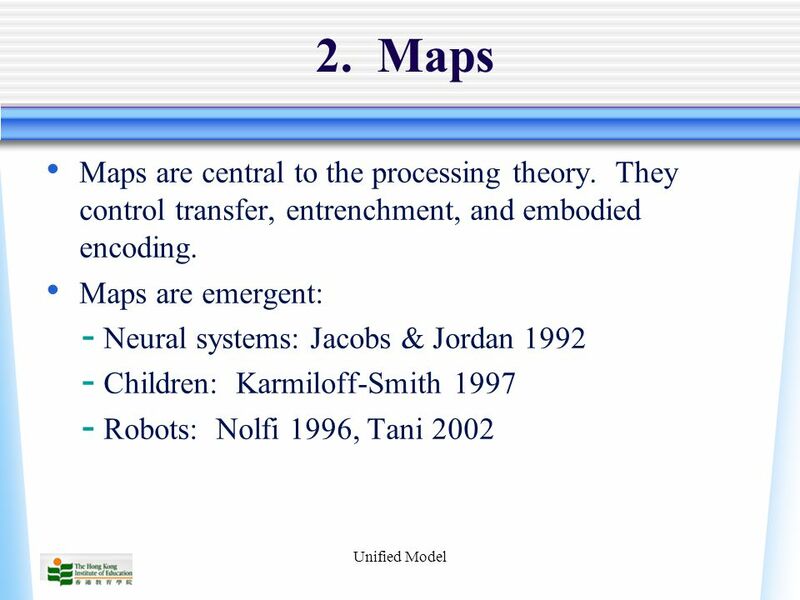 There is a learning/acquisition dichotomy. 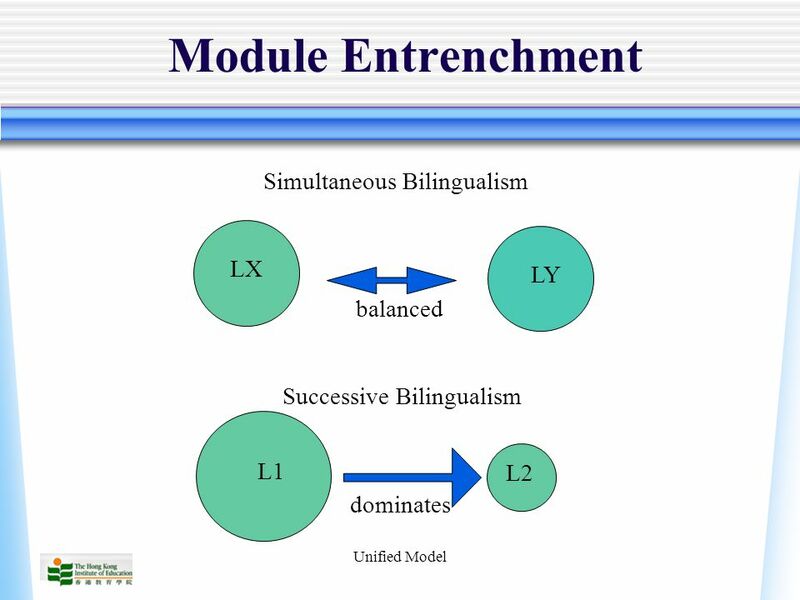 Late bilinguals can never achieve full L2 competence. 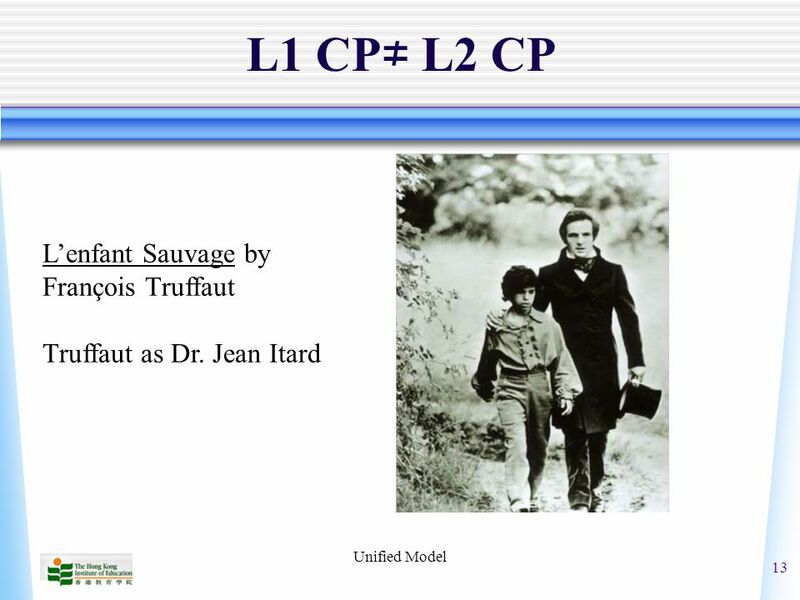 Therefore, we must start immersion L2 programs at the pre-primary level. 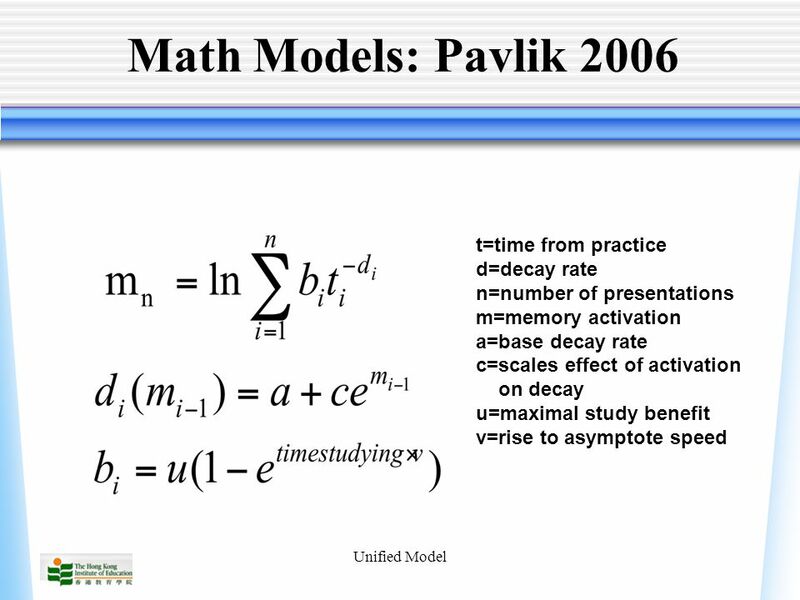 And spend billions of dollars in exposure, but not really teaching. 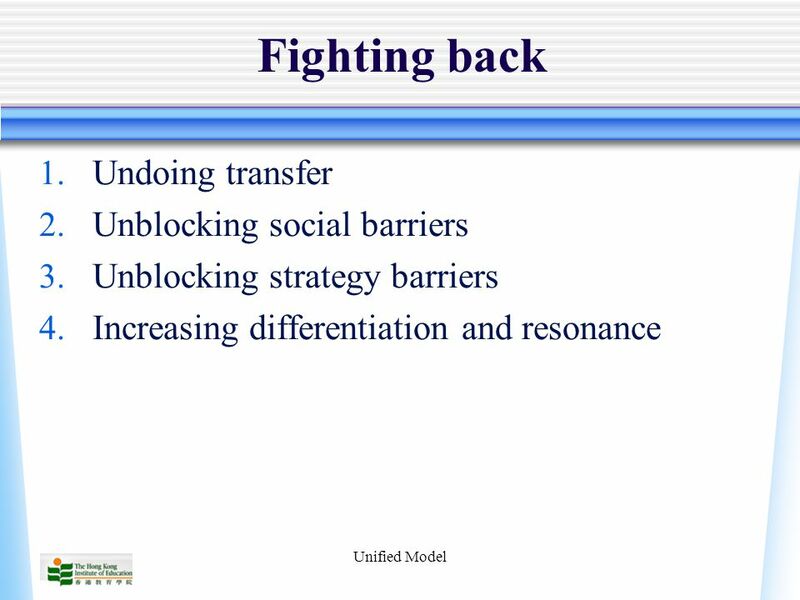 5 Unified Model Position 2: Focus on community There is a Critical Period and a learning/acquisition dichotomy. 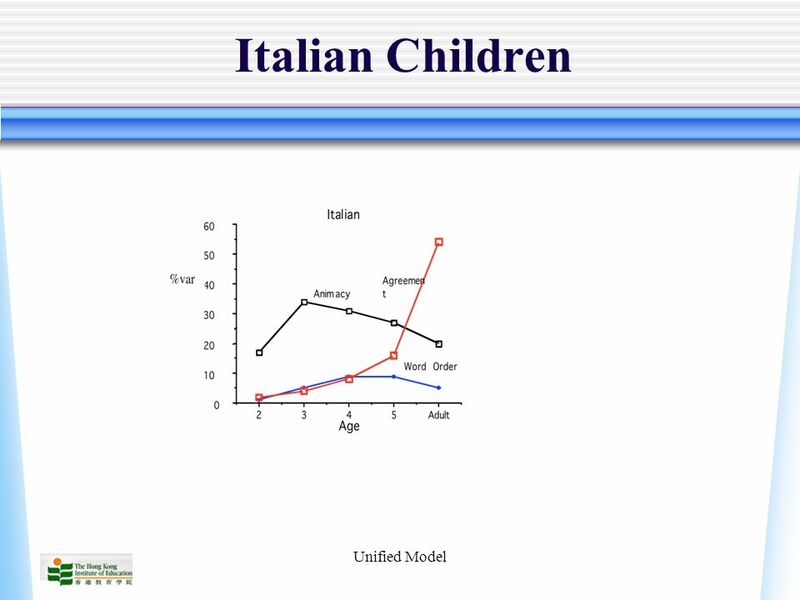 However, immersion will not work and can conflict with other goals in early childhood education. 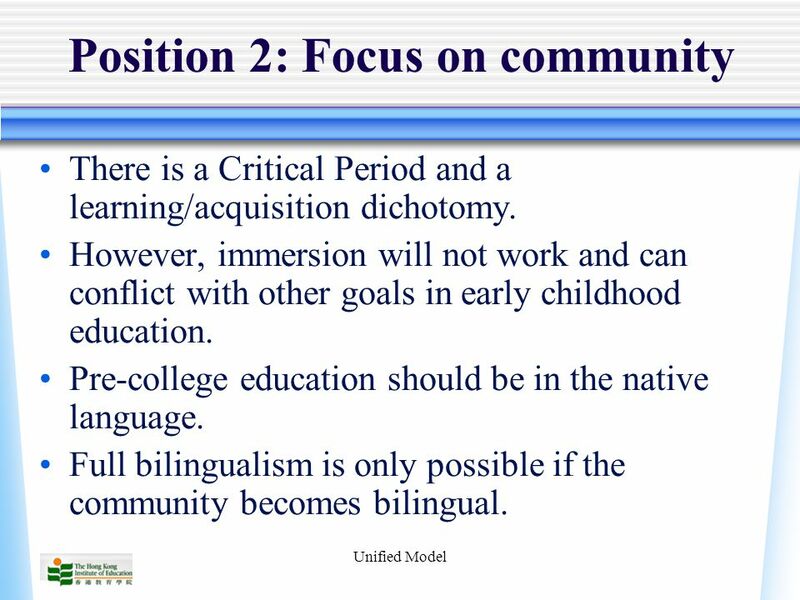 Pre-college education should be in the native language. 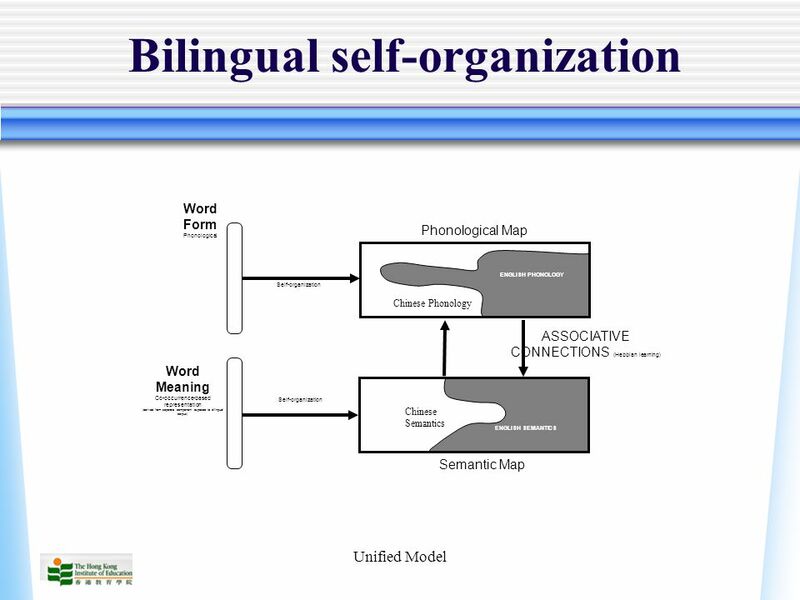 Full bilingualism is only possible if the community becomes bilingual. 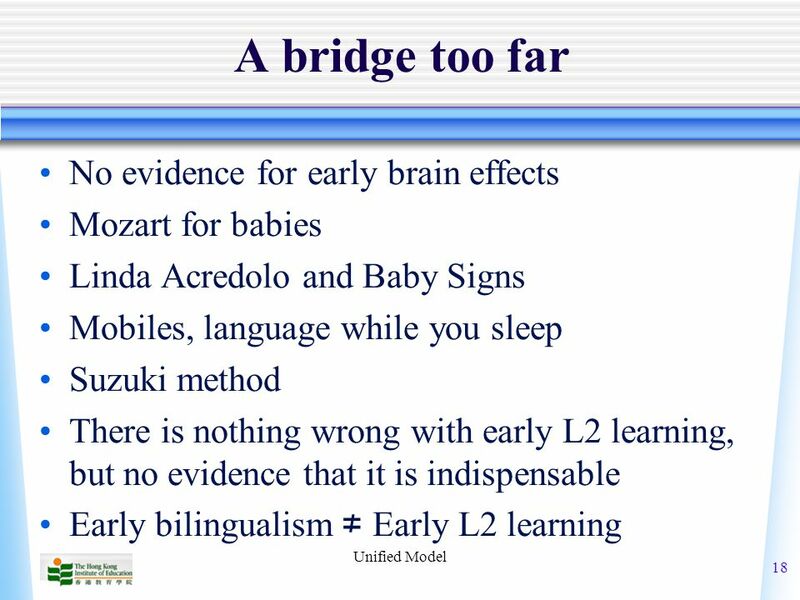 6 Unified Model Position 3: Focus on quality There is no critical period for second language learning, although there are important age effects. 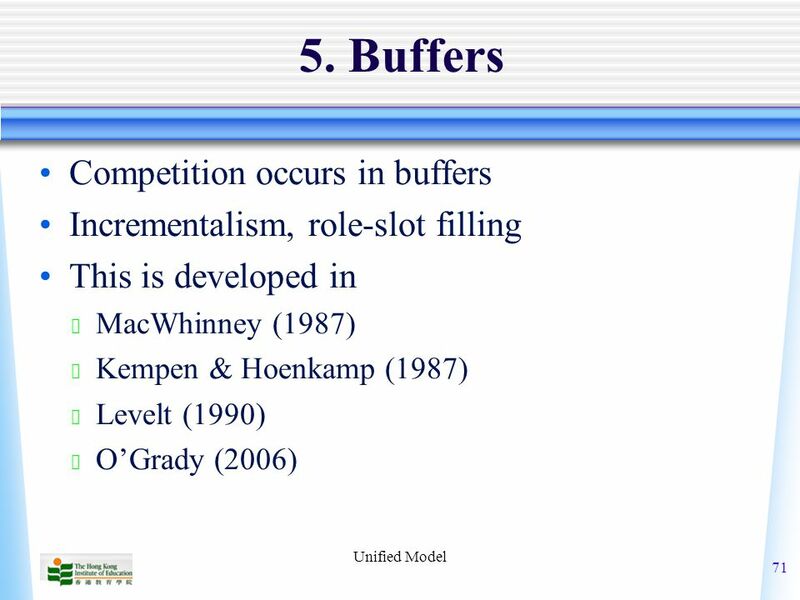 Critical period effects are due to entrenchment and competition. 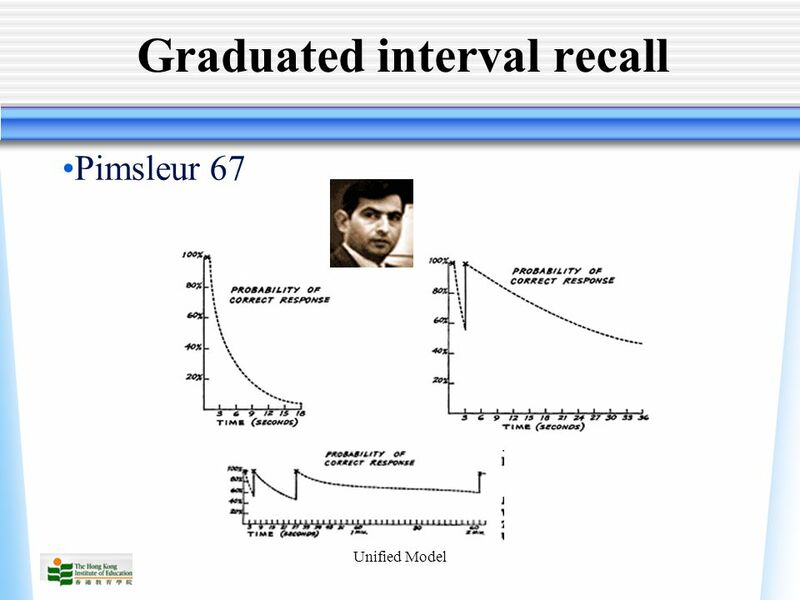 What is important is not the timing of learning, but the quality of exposure. 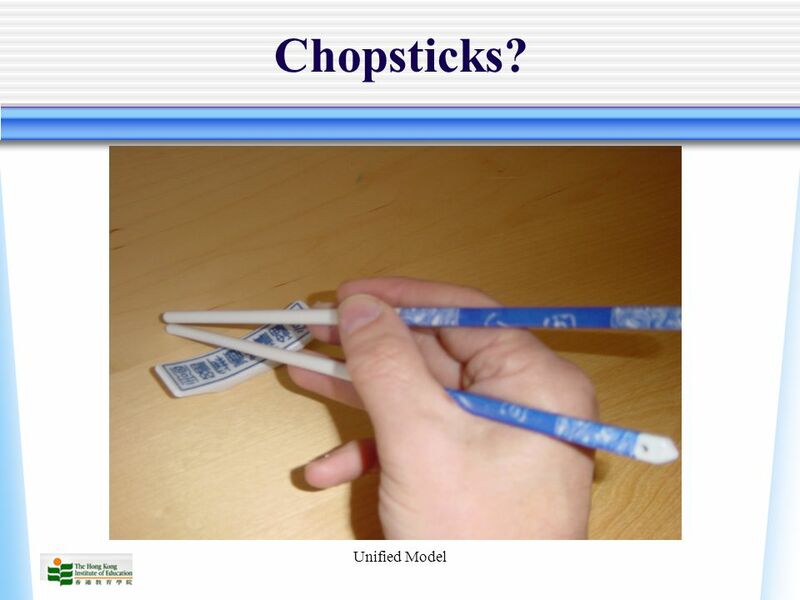 We may still need billions of dollars, but in teaching, not just exposure. 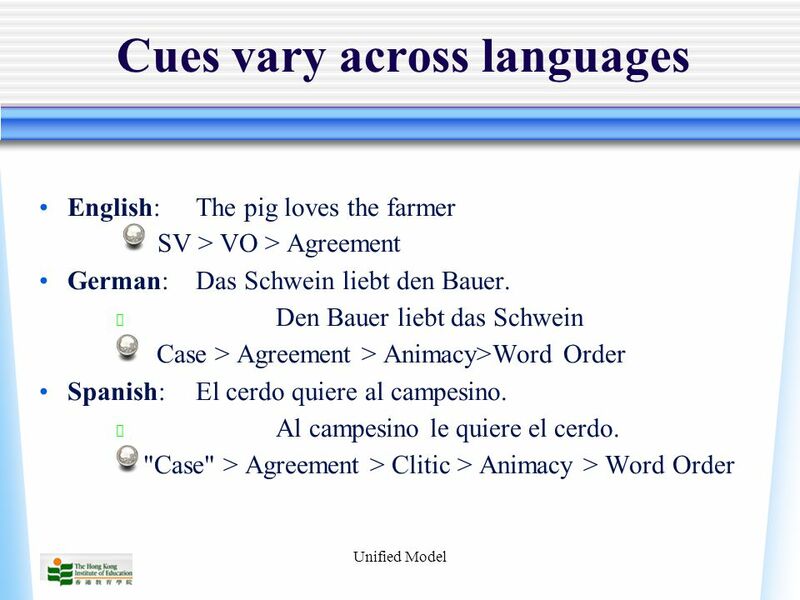 Languages can be learnt and taught. 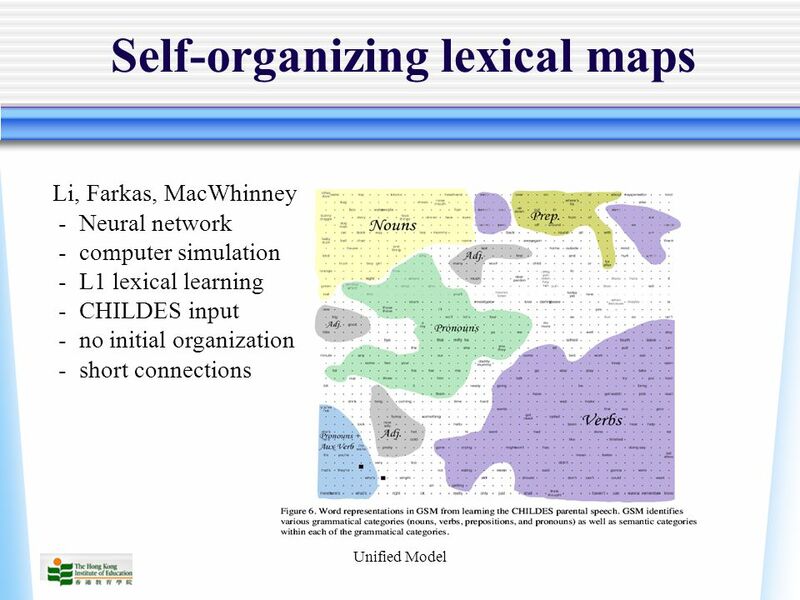 There is no real learning/acquisition dichotomy. 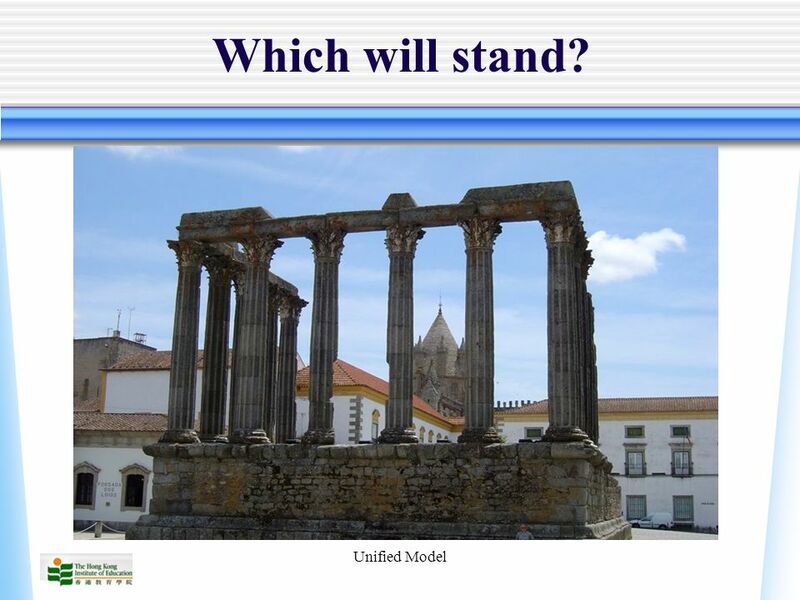 10 Unified Model Which will stand? 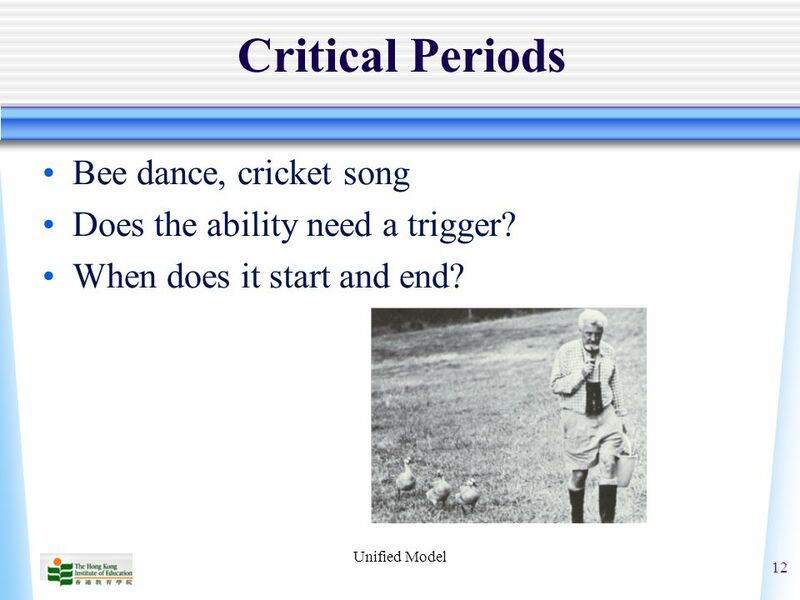 12 Unified Model 12 Critical Periods Bee dance, cricket song Does the ability need a trigger? 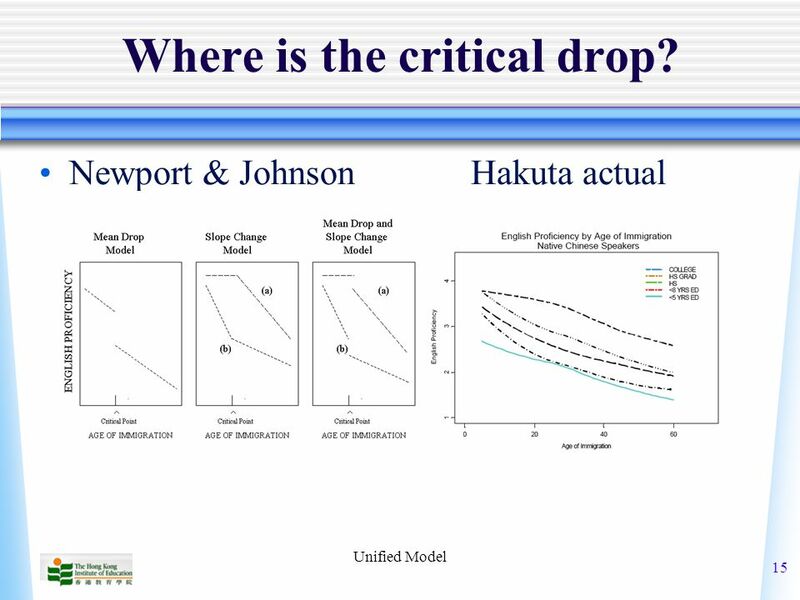 When does it start and end? 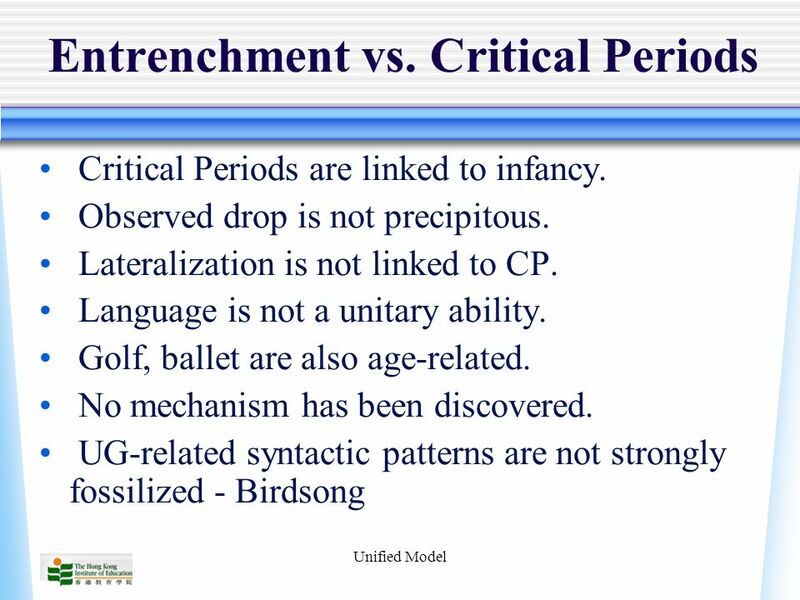 17 Unified Model 17 What we know Critical periods are basic to embryology. 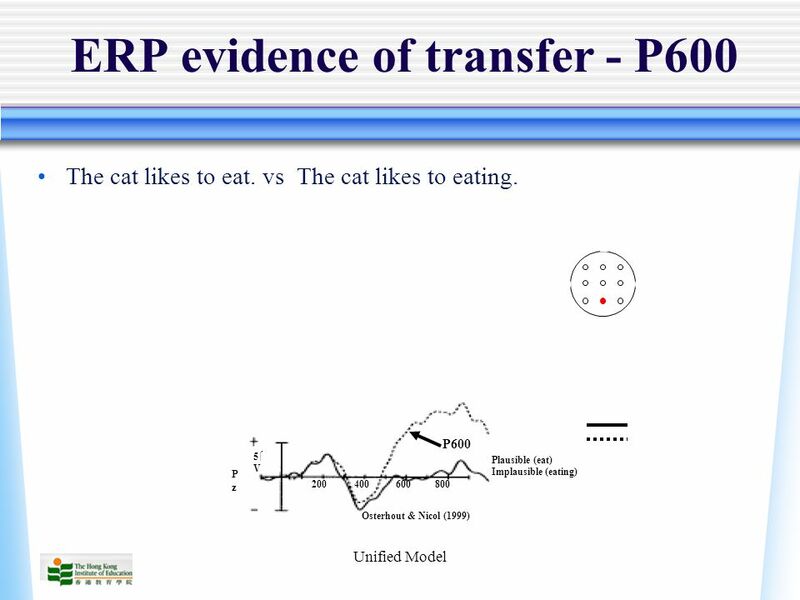 Critical periods for binocular vision in cats; periods for exposure to song in birds; precocial bird attachment; Animals have many instincts; but is language an instinct? 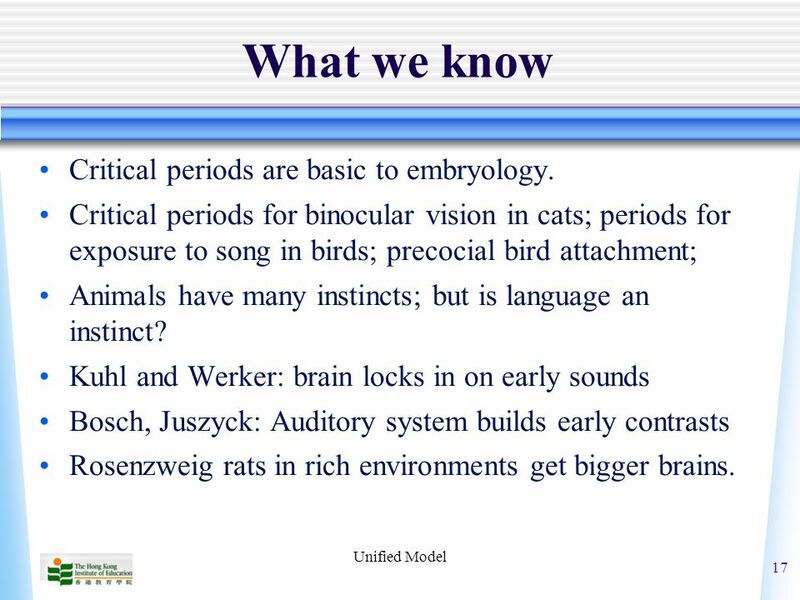 Kuhl and Werker: brain locks in on early sounds Bosch, Juszyck: Auditory system builds early contrasts Rosenzweig rats in rich environments get bigger brains. 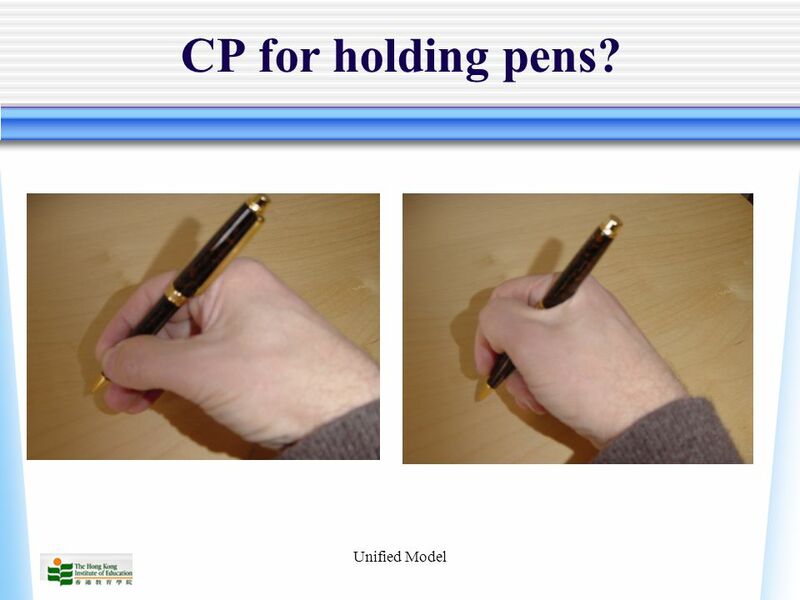 19 Unified Model CP for holding pens? 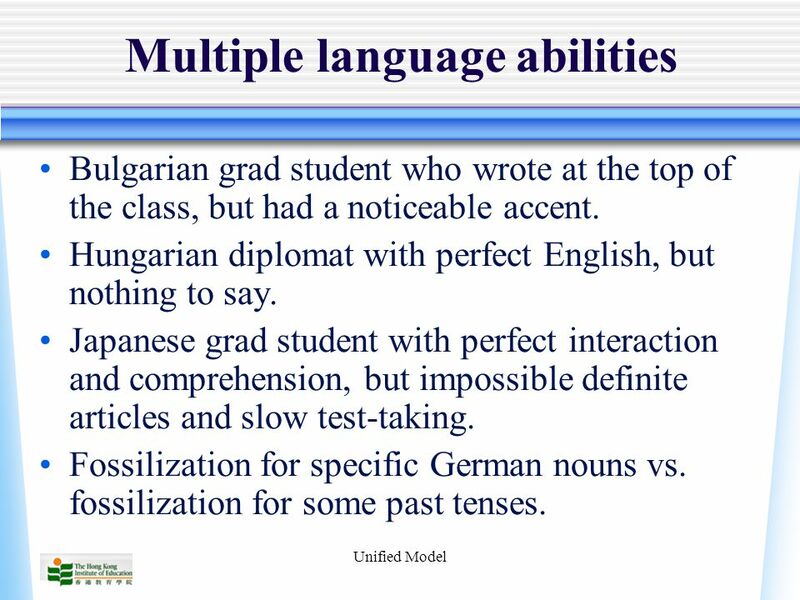 21 Unified Model Multiple language abilities Bulgarian grad student who wrote at the top of the class, but had a noticeable accent. 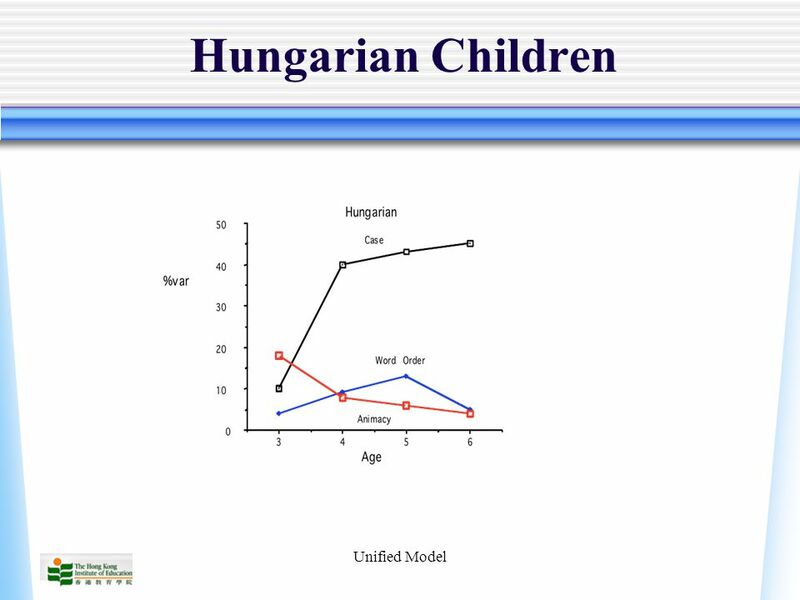 Hungarian diplomat with perfect English, but nothing to say. 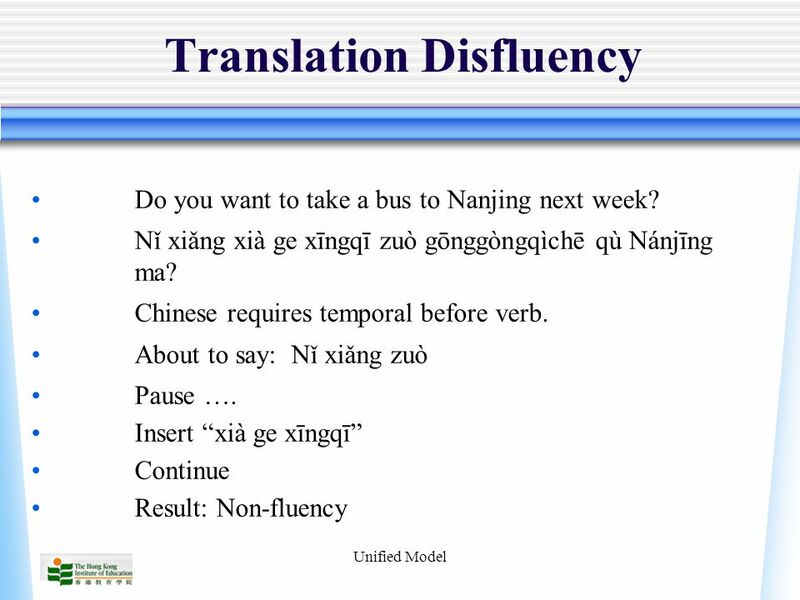 Japanese grad student with perfect interaction and comprehension, but impossible definite articles and slow test-taking. 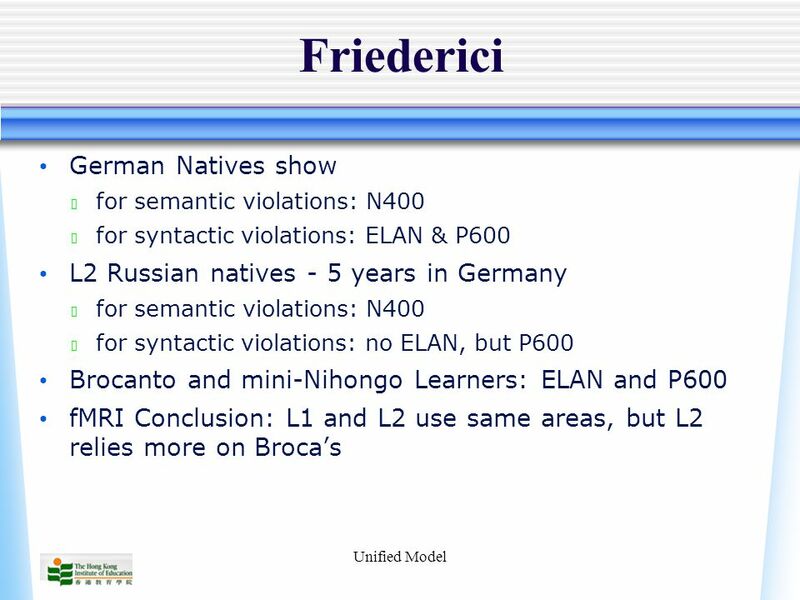 Fossilization for specific German nouns vs. fossilization for some past tenses. 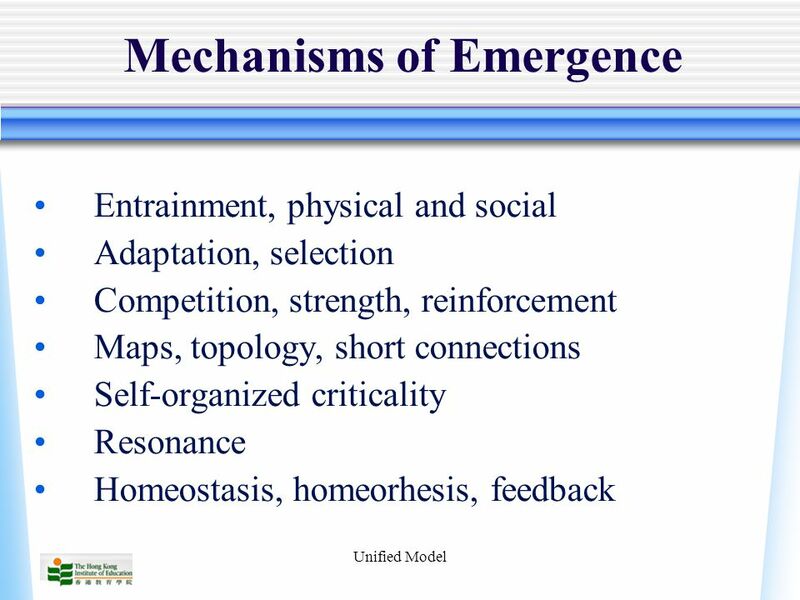 25 Unified Model Why the shift to emergentism? 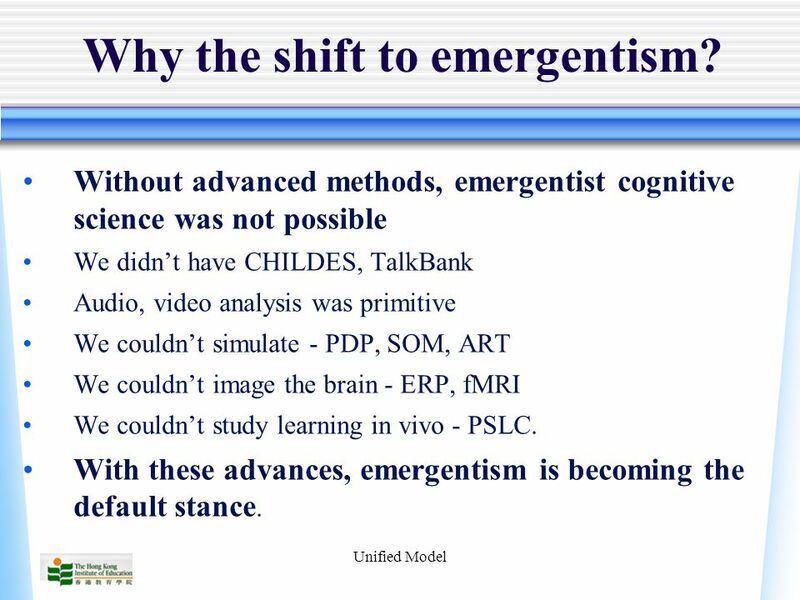 Without advanced methods, emergentist cognitive science was not possible We didn’t have CHILDES, TalkBank Audio, video analysis was primitive We couldn’t simulate - PDP, SOM, ART We couldn’t image the brain - ERP, fMRI We couldn’t study learning in vivo - PSLC. 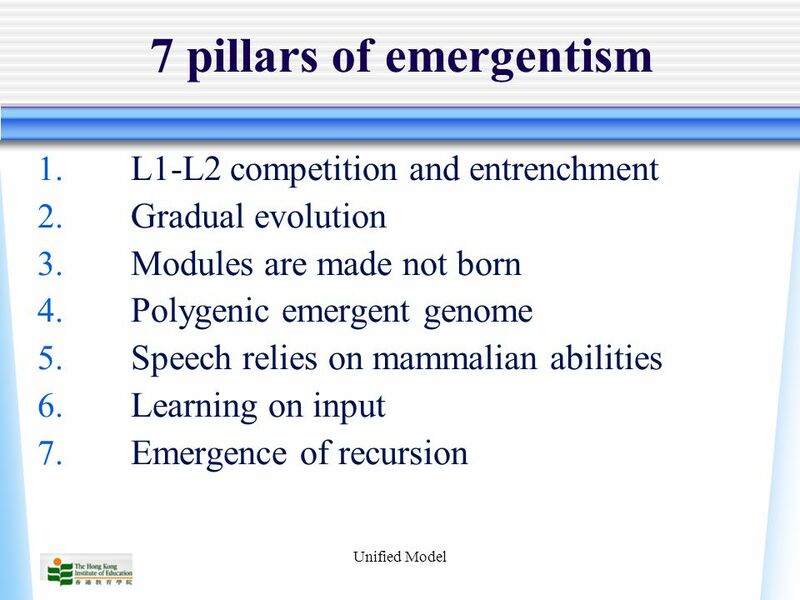 With these advances, emergentism is becoming the default stance. 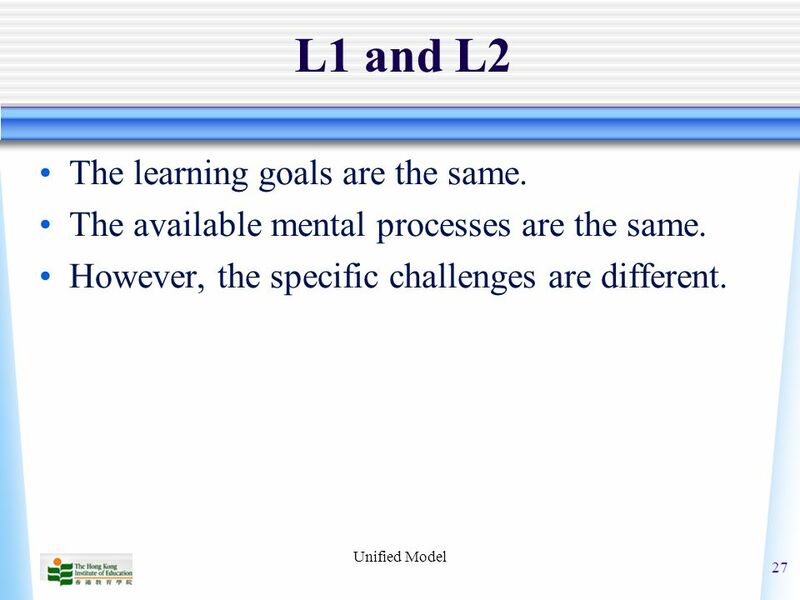 27 Unified Model 27 L1 and L2 The learning goals are the same. 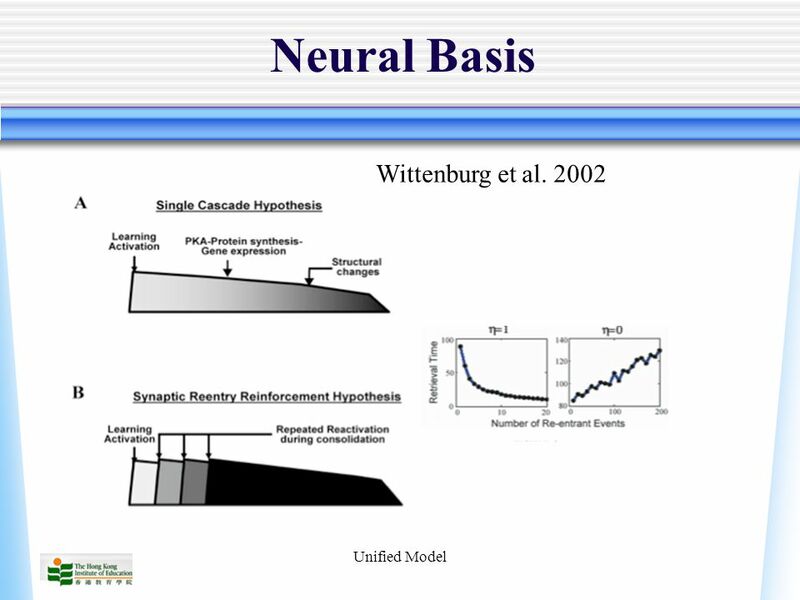 The available mental processes are the same. 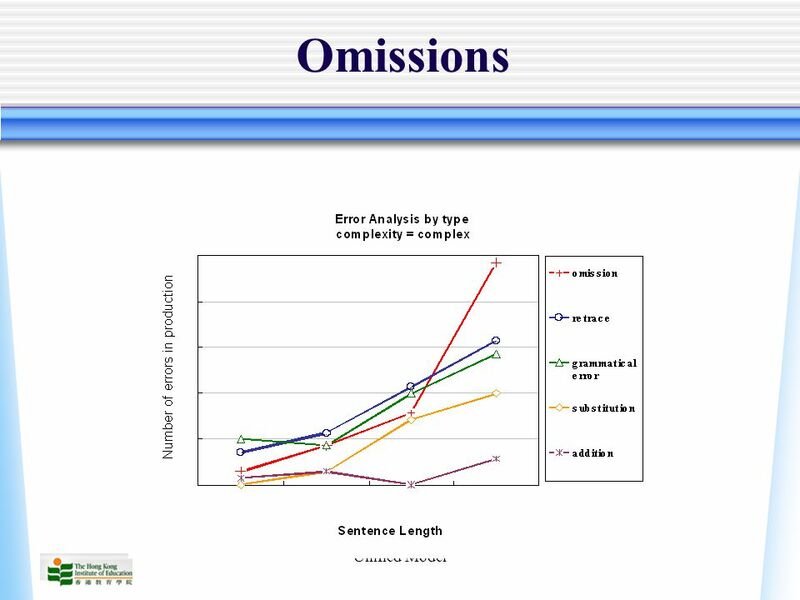 However, the specific challenges are different. 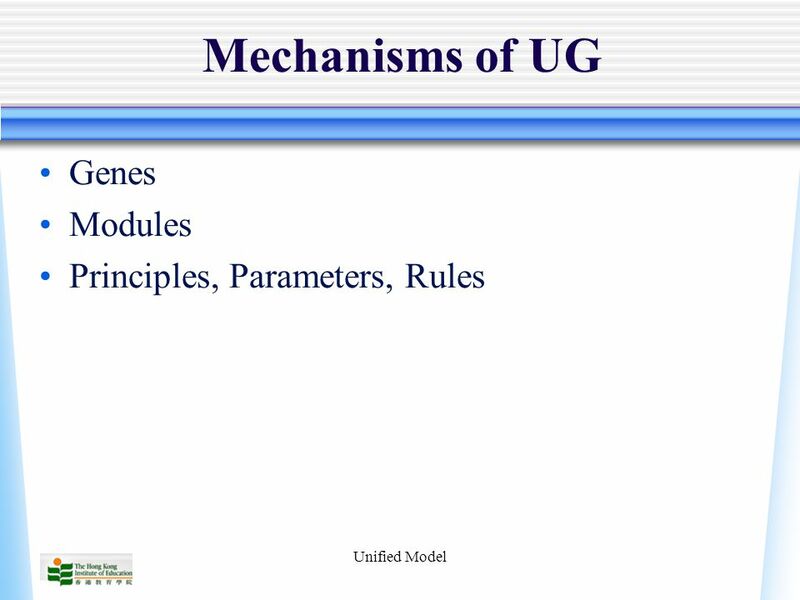 31 Unified Model 1. 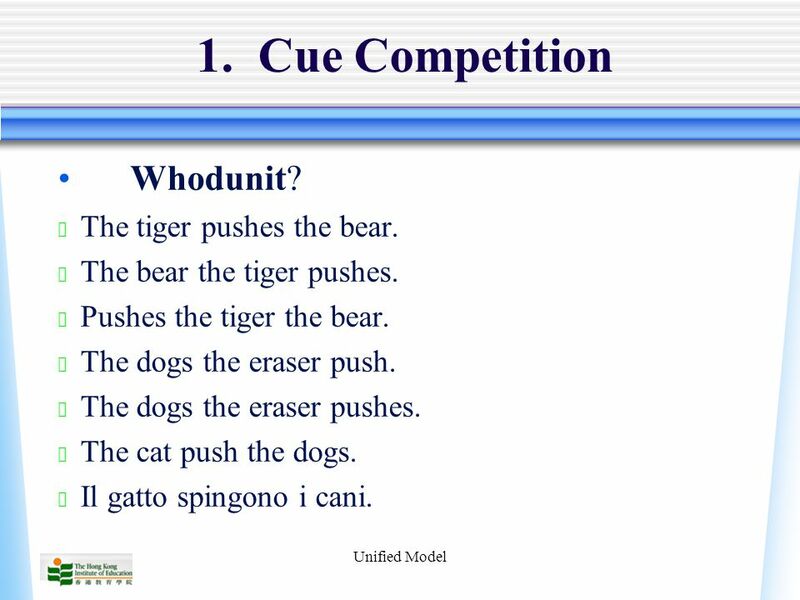 Cue Competition Whodunit? 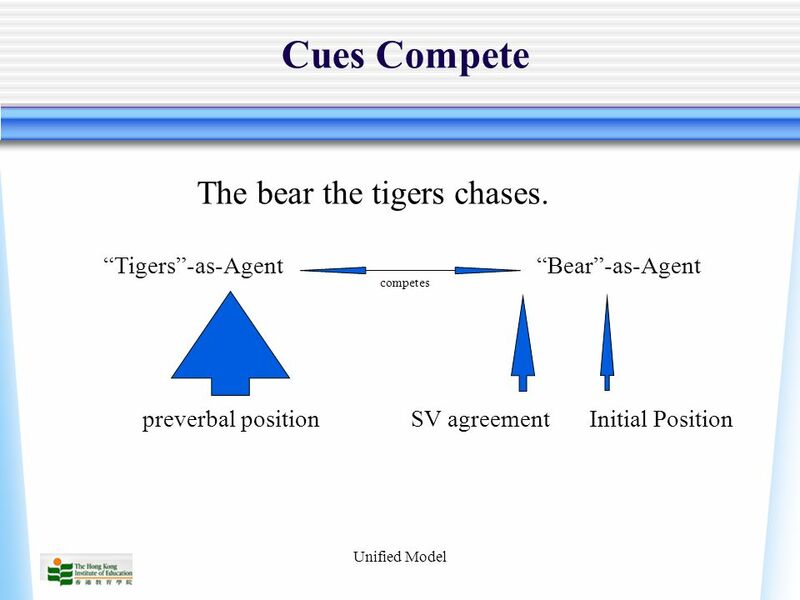 ★ The tiger pushes the bear. ★ The bear the tiger pushes. ★ Pushes the tiger the bear. ★ The dogs the eraser push. ★ The dogs the eraser pushes. ★ The cat push the dogs. ★ Il gatto spingono i cani. 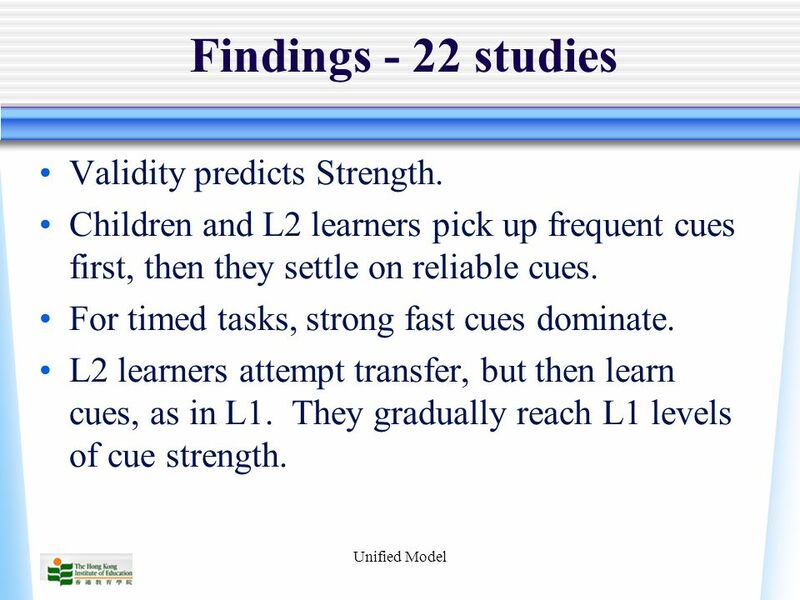 43 Unified Model Findings - 22 studies Validity predicts Strength. 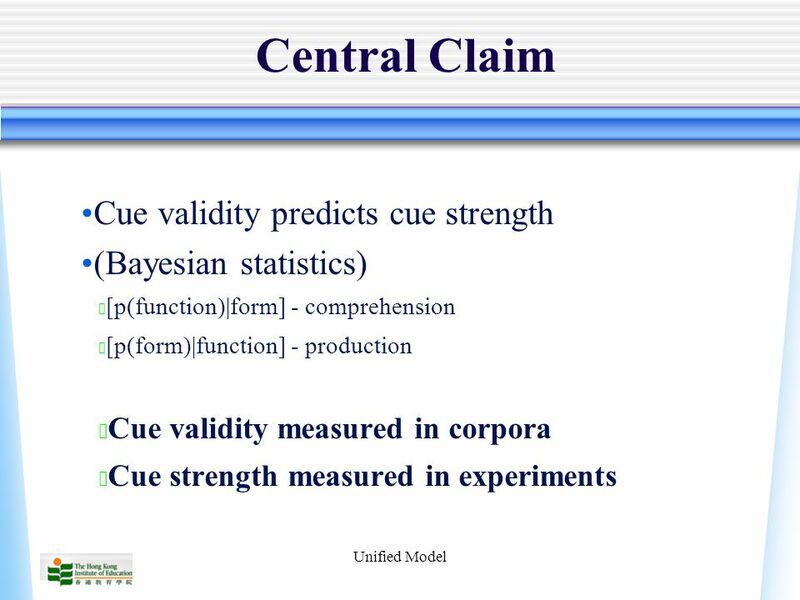 Children and L2 learners pick up frequent cues first, then they settle on reliable cues. 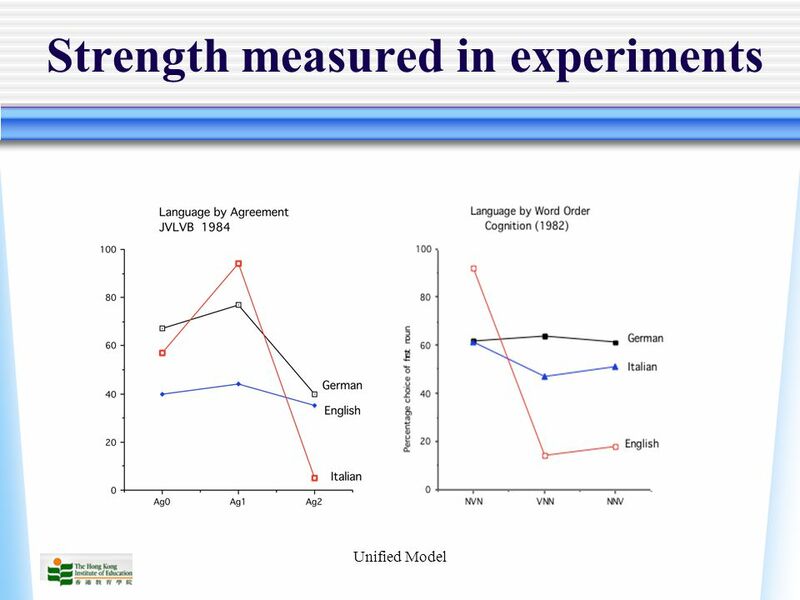 For timed tasks, strong fast cues dominate. 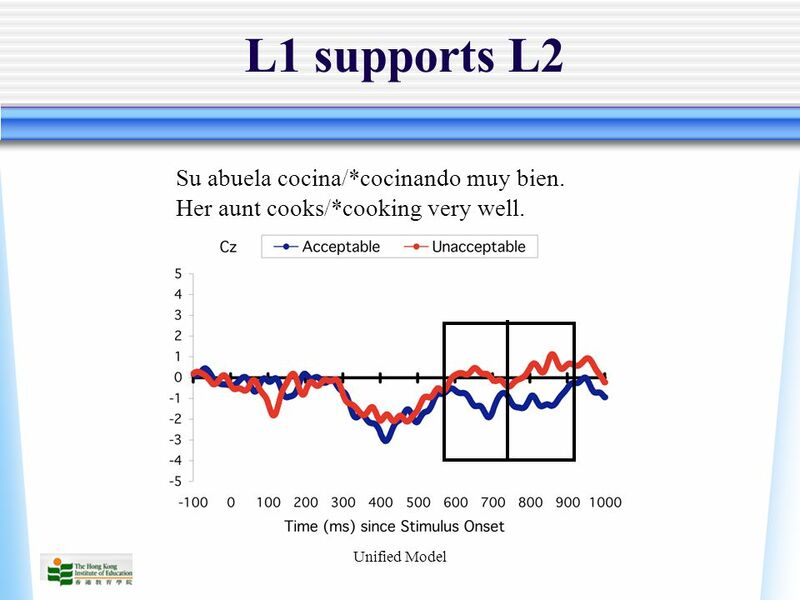 L2 learners attempt transfer, but then learn cues, as in L1. 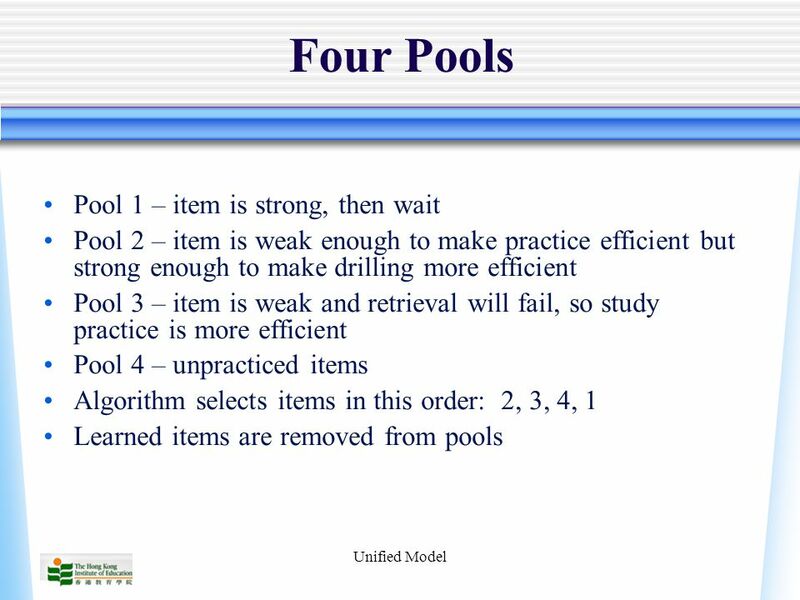 They gradually reach L1 levels of cue strength. 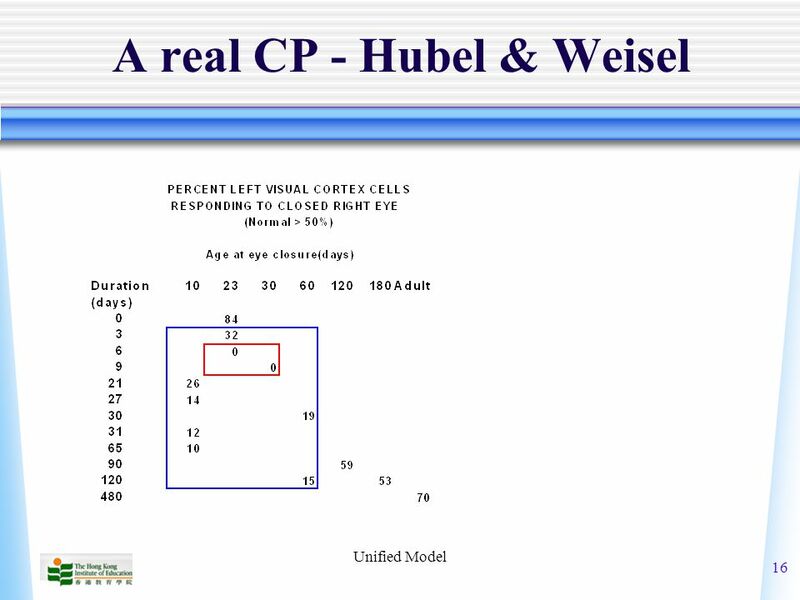 51 Unified Model 3. 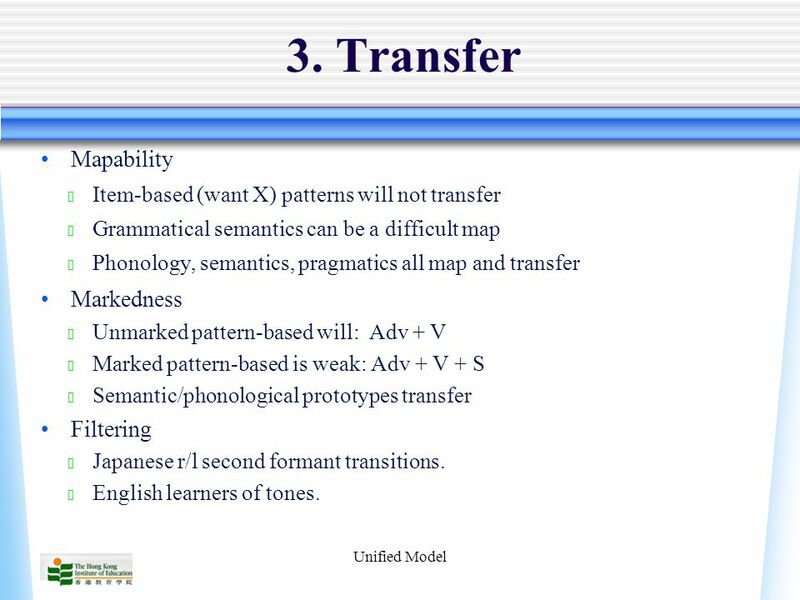 Transfer Mapability ★ Item-based (want X) patterns will not transfer ★ Grammatical semantics can be a difficult map ★ Phonology, semantics, pragmatics all map and transfer Markedness ★ Unmarked pattern-based will: Adv + V ★ Marked pattern-based is weak: Adv + V + S ★ Semantic/phonological prototypes transfer Filtering ★ Japanese r/l second formant transitions. 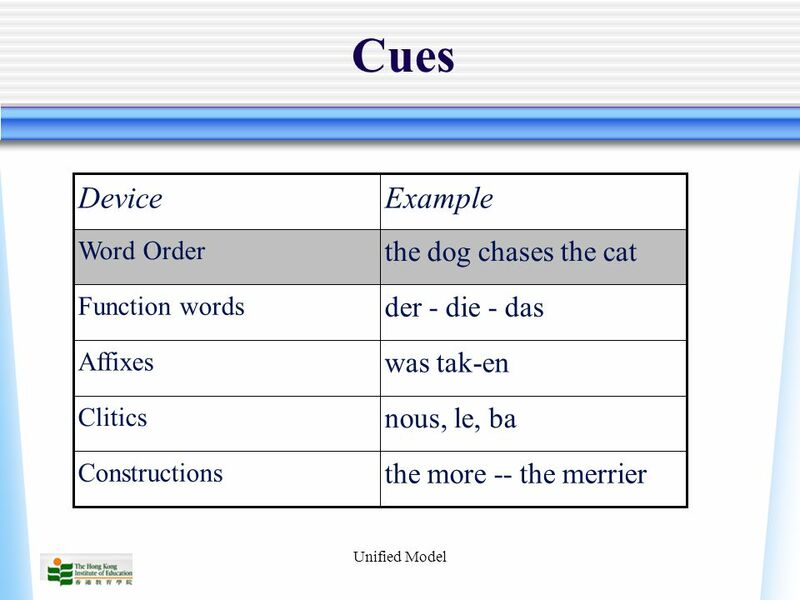 ★ English learners of tones. 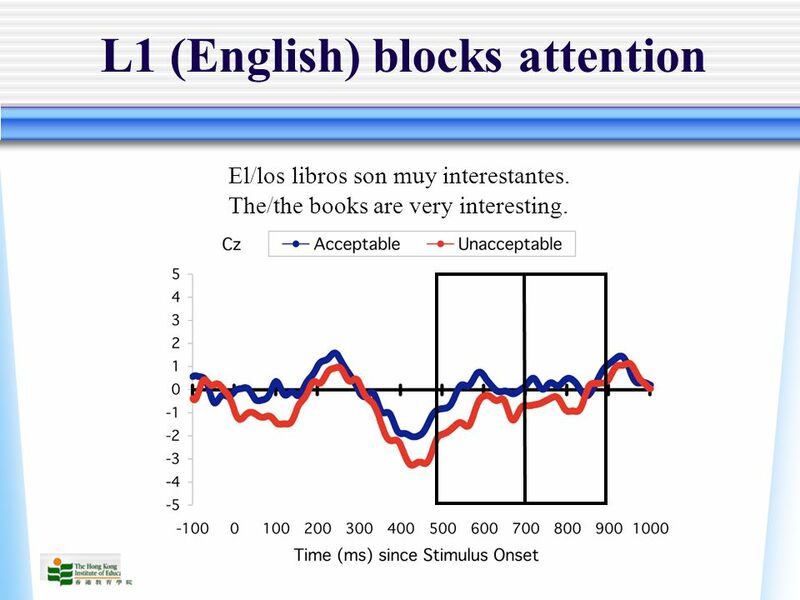 60 Unified Model L1 (English) blocks attention El/los libros son muy interestantes. 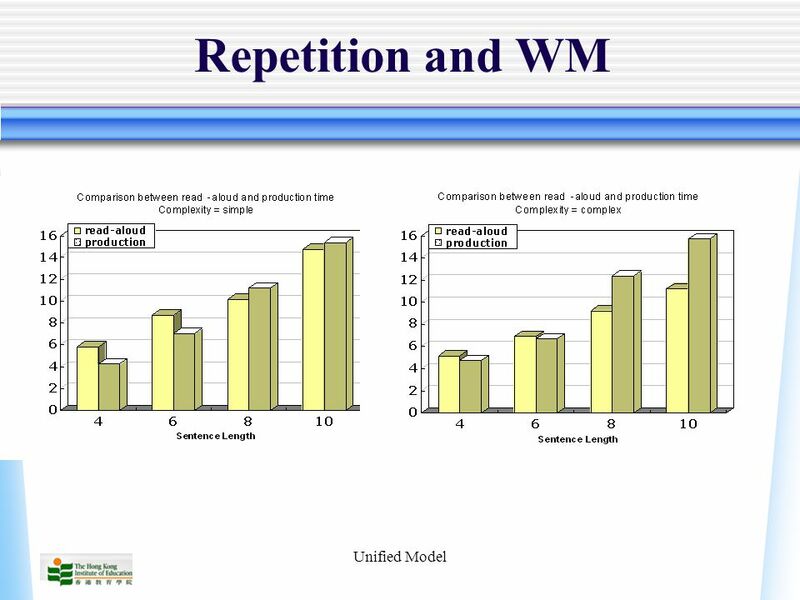 The/the books are very interesting. 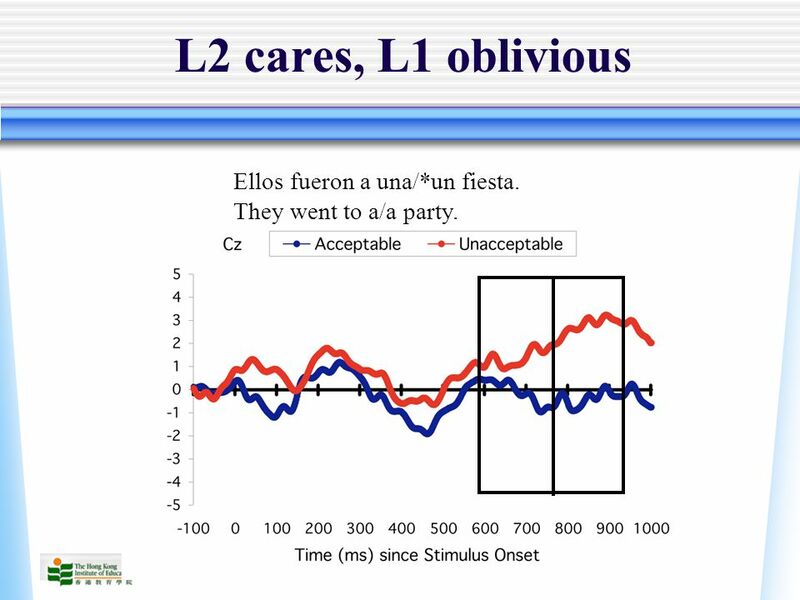 61 Unified Model L2 cares, L1 oblivious Ellos fueron a una/*un fiesta. They went to a/a party. 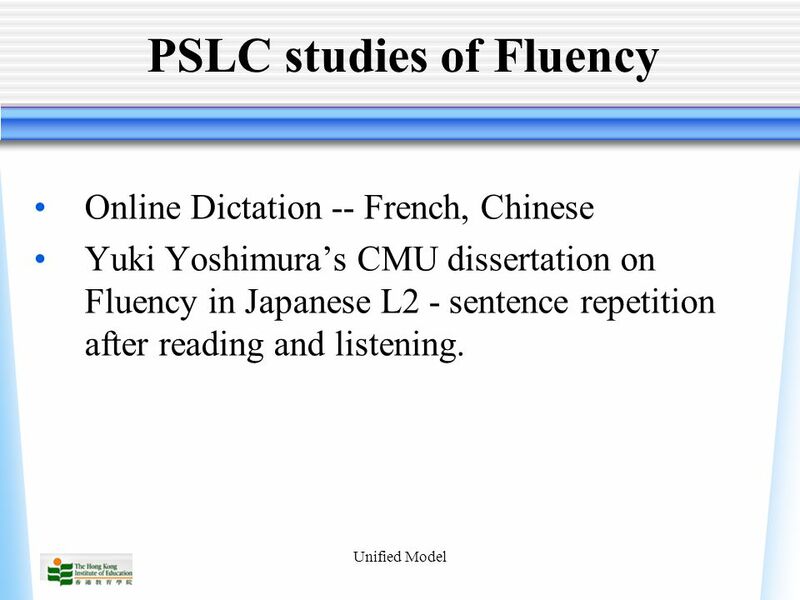 66 Unified Model PSLC studies of Fluency Online Dictation -- French, Chinese Yuki Yoshimura’s CMU dissertation on Fluency in Japanese L2 - sentence repetition after reading and listening. 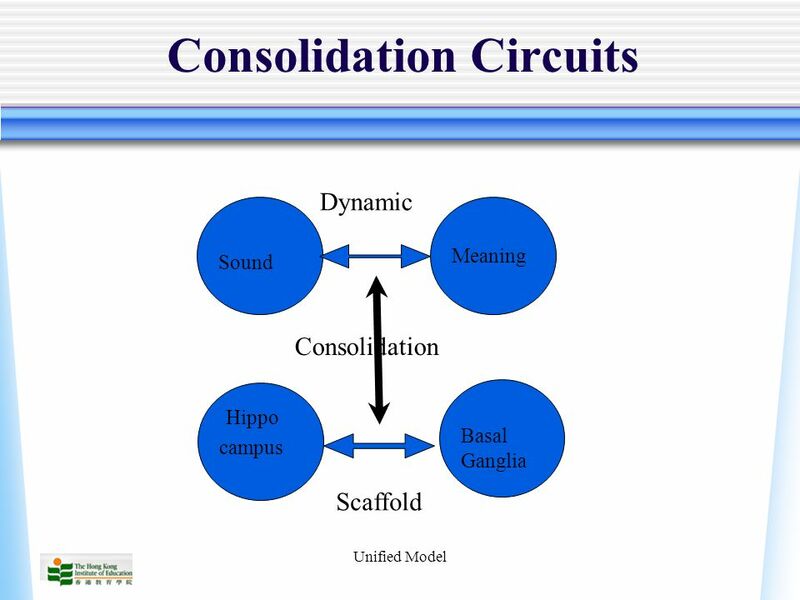 77 Unified Model Consolidation and Time Bones, muscles, cell walls, mitochondria, and immune system becomes stronger after periods of use and breakage. 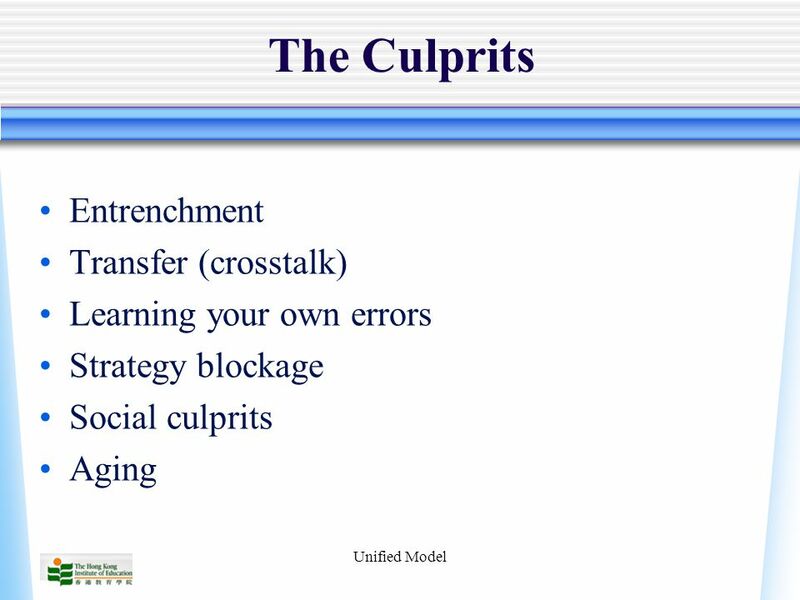 These systems respond to pressures across time frames. 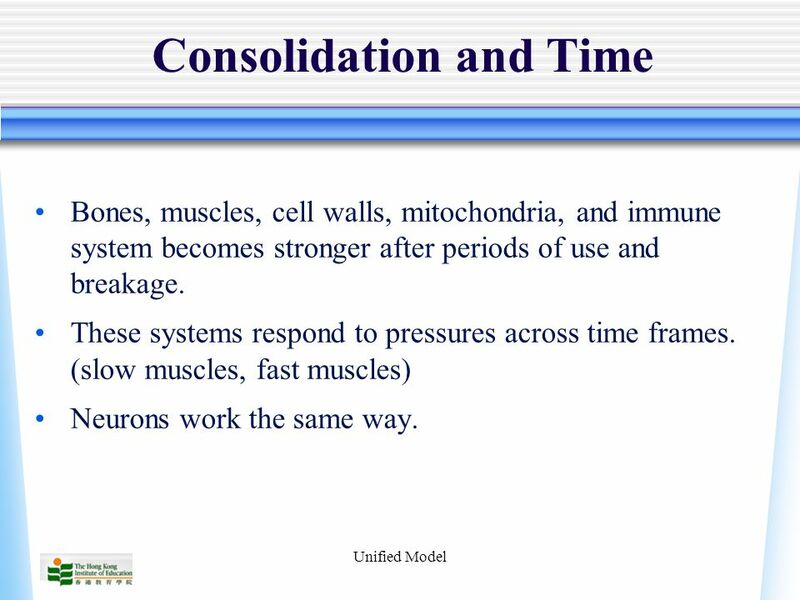 (slow muscles, fast muscles) Neurons work the same way. 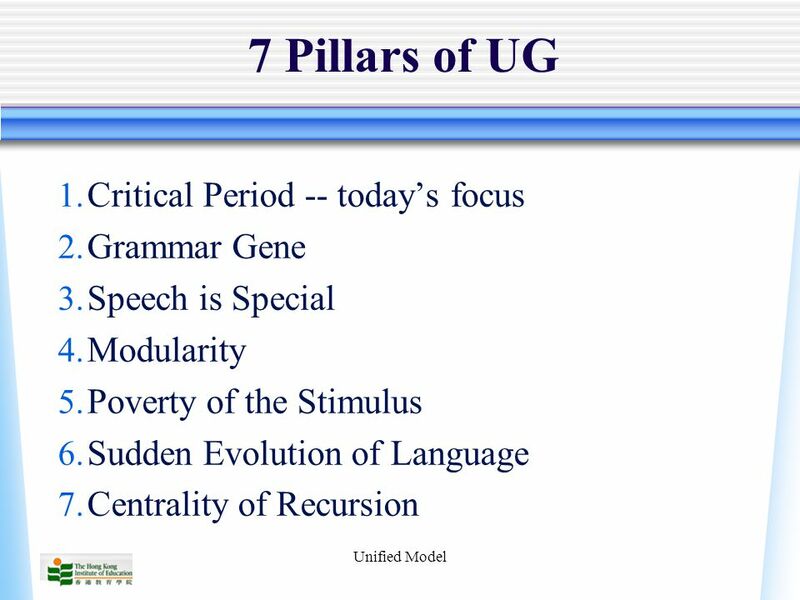 81 Unified Model 7. 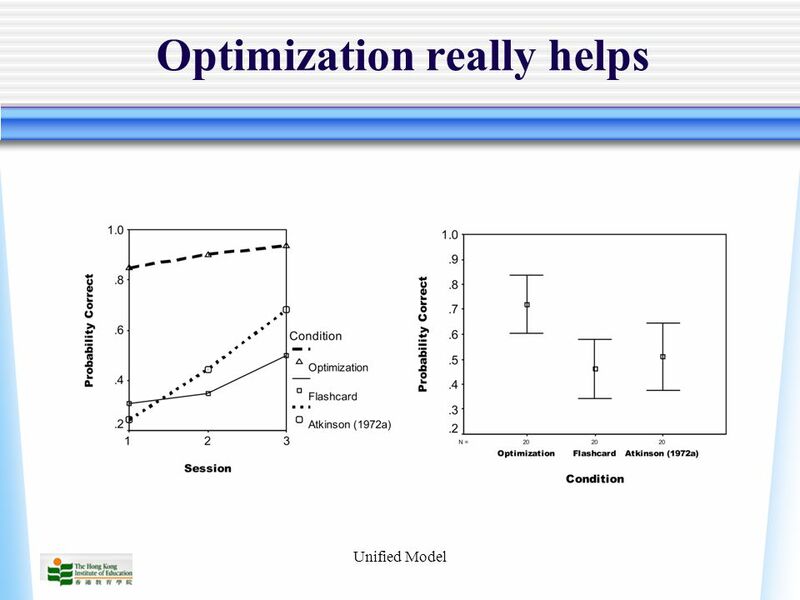 Mental models We build up mental models through perspective-taking. 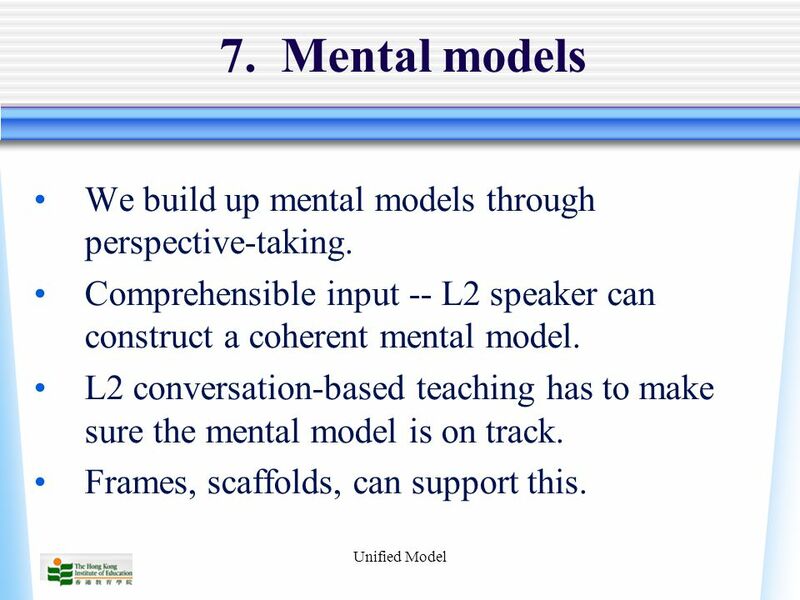 Comprehensible input -- L2 speaker can construct a coherent mental model. 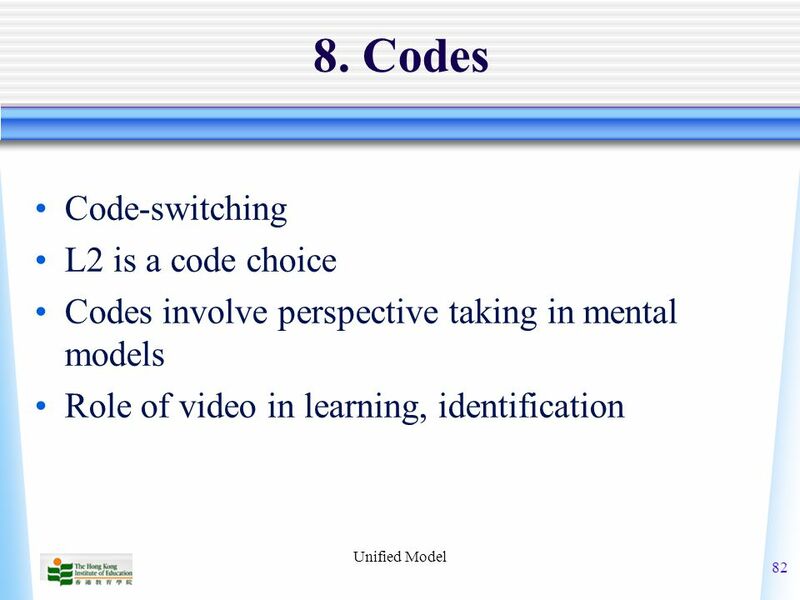 L2 conversation-based teaching has to make sure the mental model is on track. 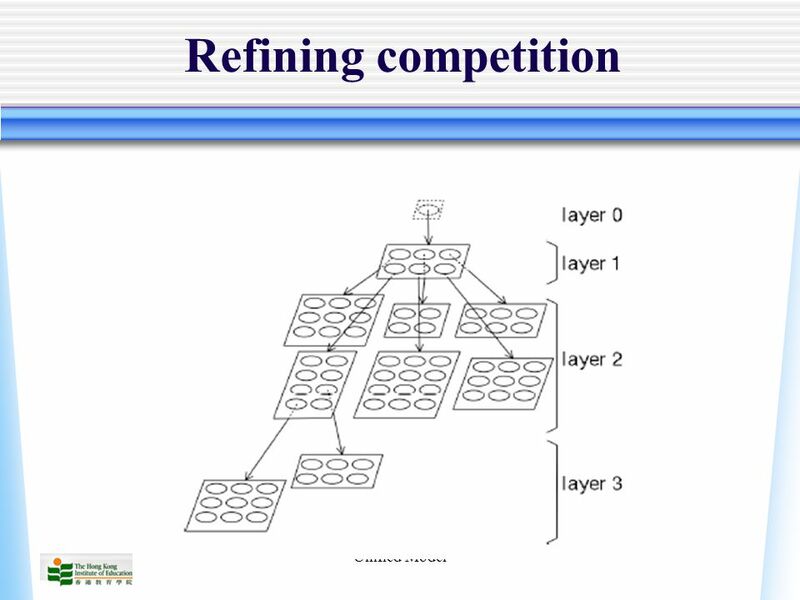 Frames, scaffolds, can support this. 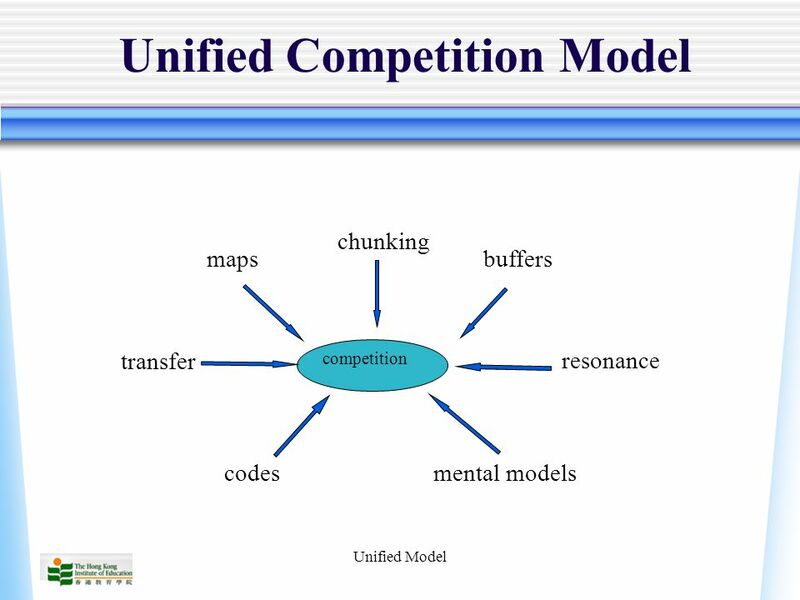 83 Unified Model The Unified Model Competition is central. 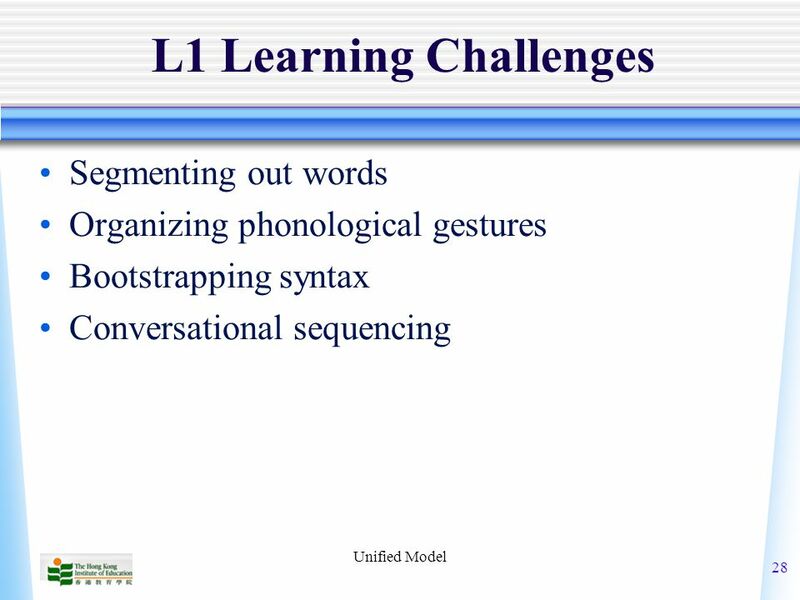 Both L1 and L2 are emergent. 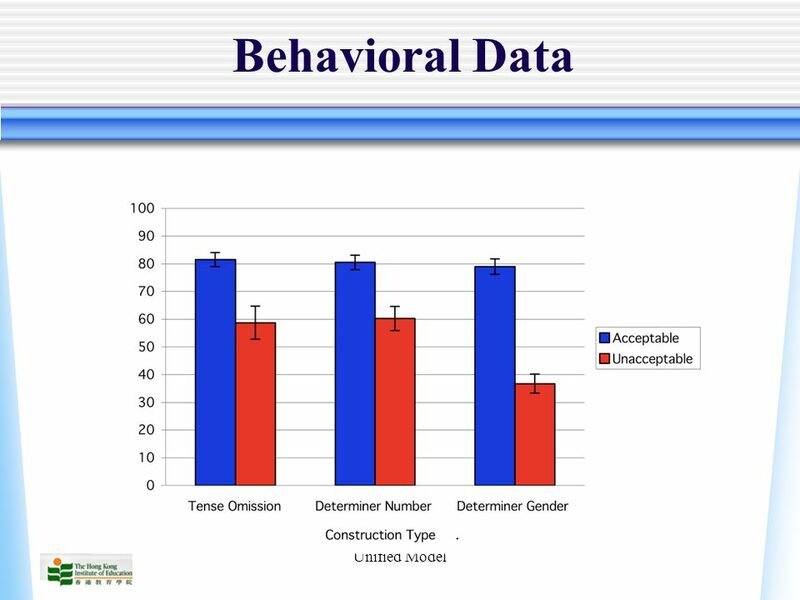 Item-based constructions compete in L1 and L2 learning. 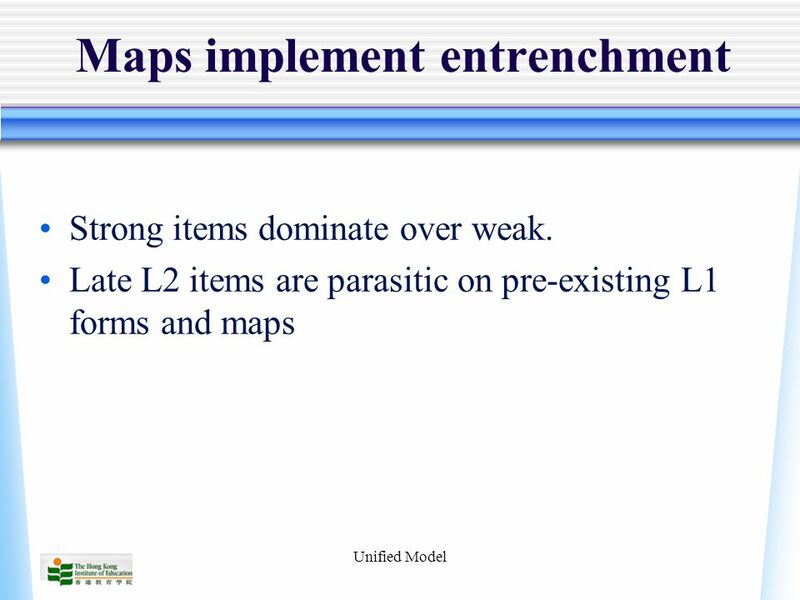 Transfer arises from entrenchment in maps. 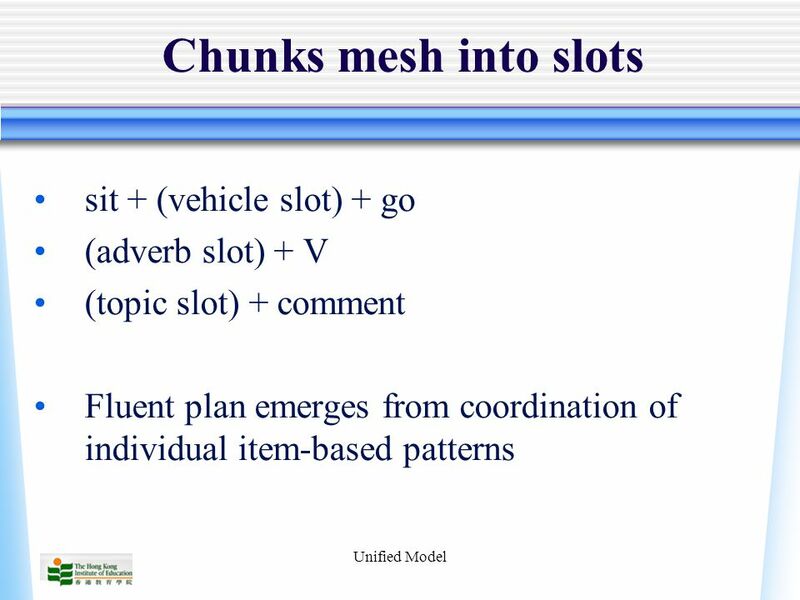 Fluency develops through chunk meshing. 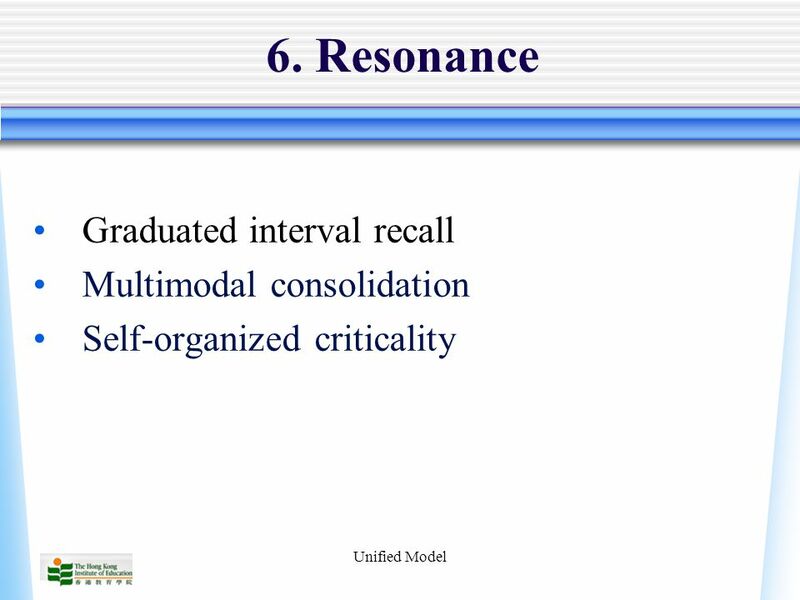 Resonance and spacing produce robust learning. 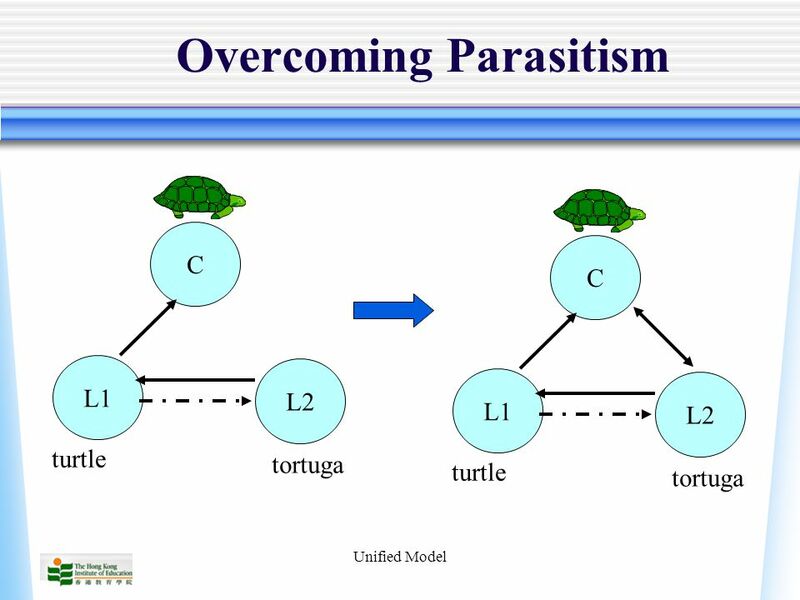 Conversation supports perspective switching and model construction. 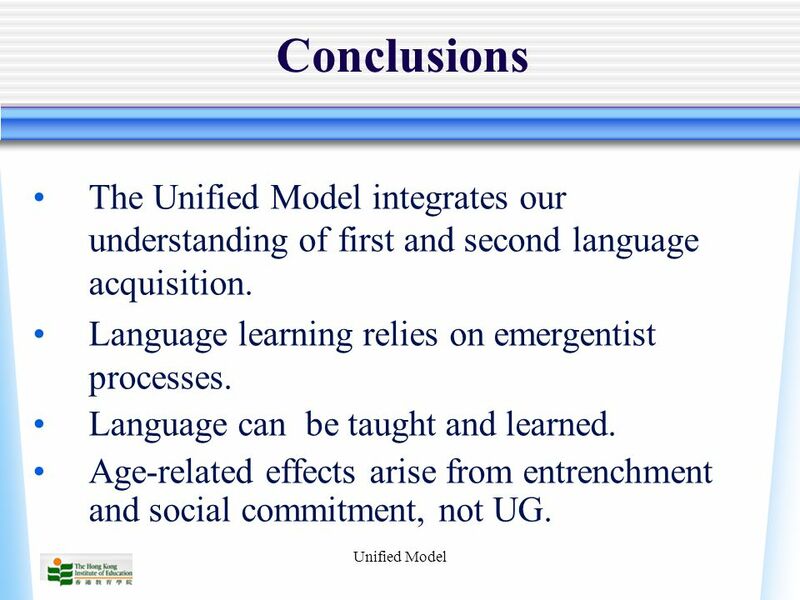 84 Unified Model Conclusions The Unified Model integrates our understanding of first and second language acquisition. 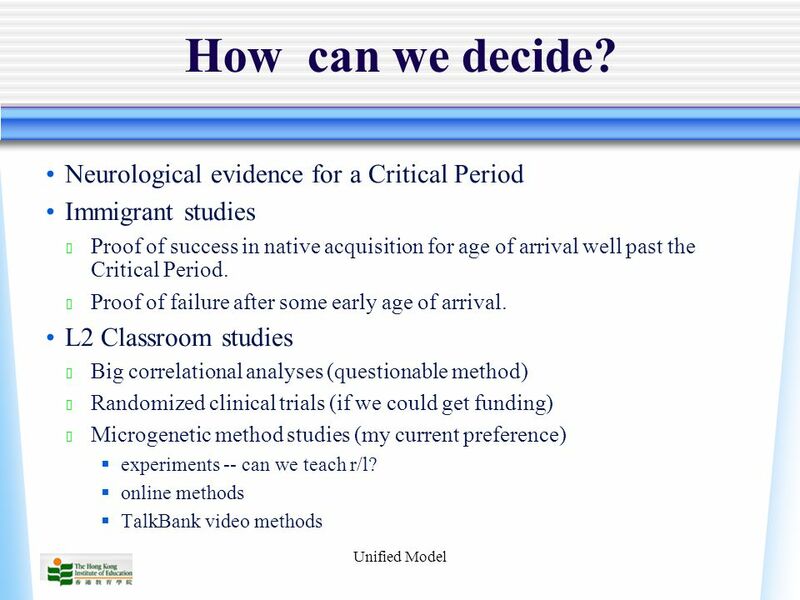 Language learning relies on emergentist processes. 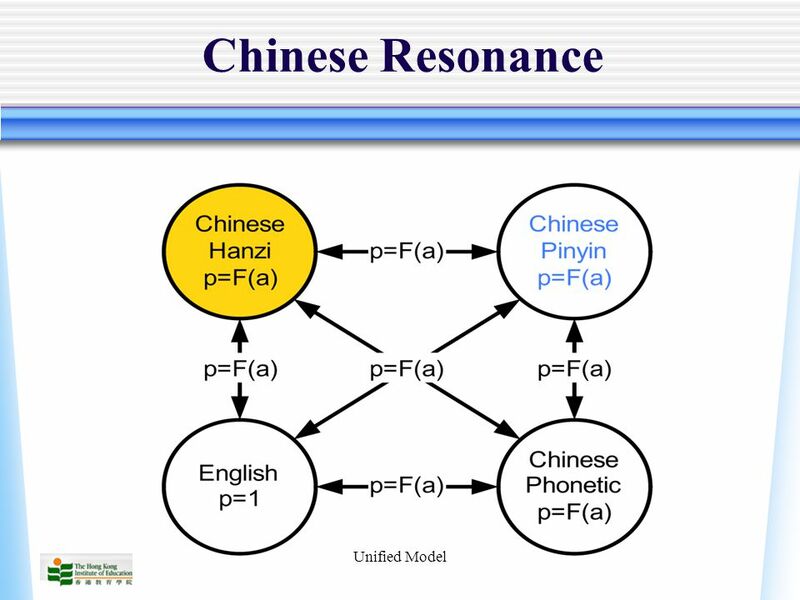 Language can be taught and learned. 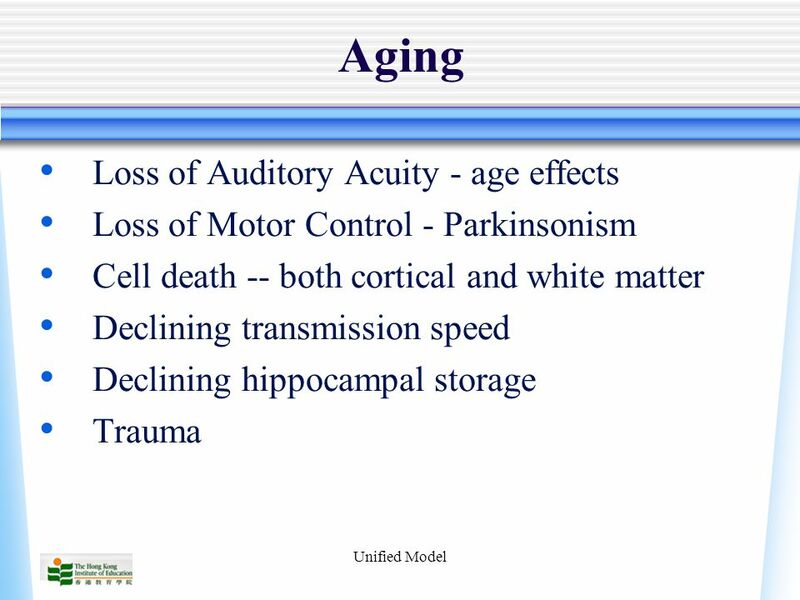 Age-related effects arise from entrenchment and social commitment, not UG. 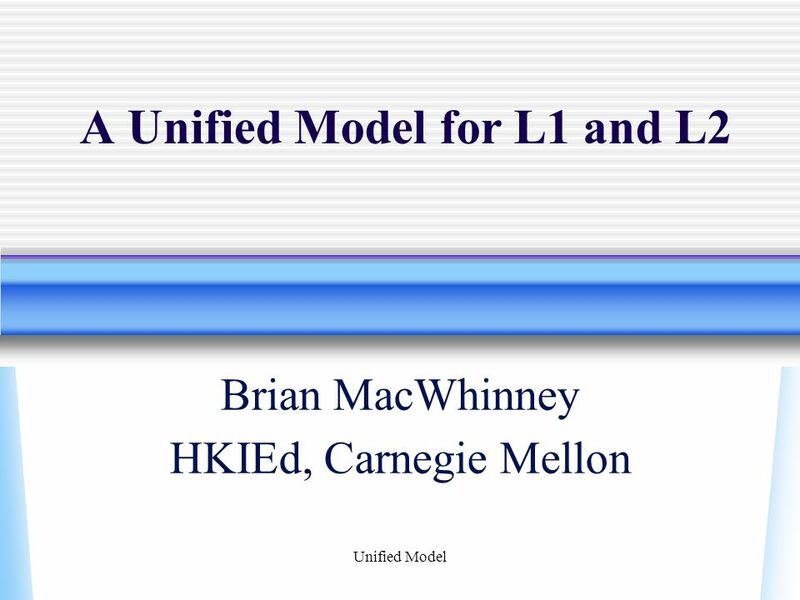 Download ppt "Unified Model A Unified Model for L1 and L2 Brian MacWhinney HKIEd, Carnegie Mellon." 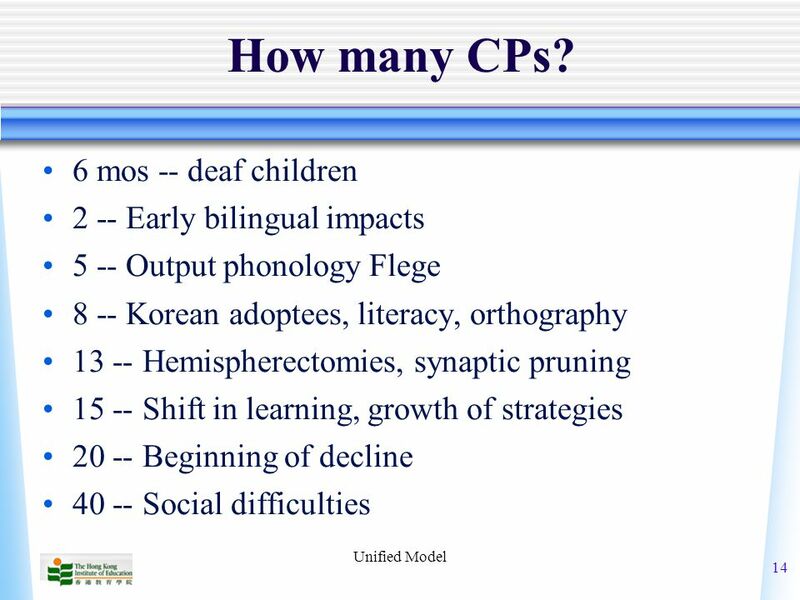 Second Language Acquisition and the Critical Period Grant Goodall Dept. 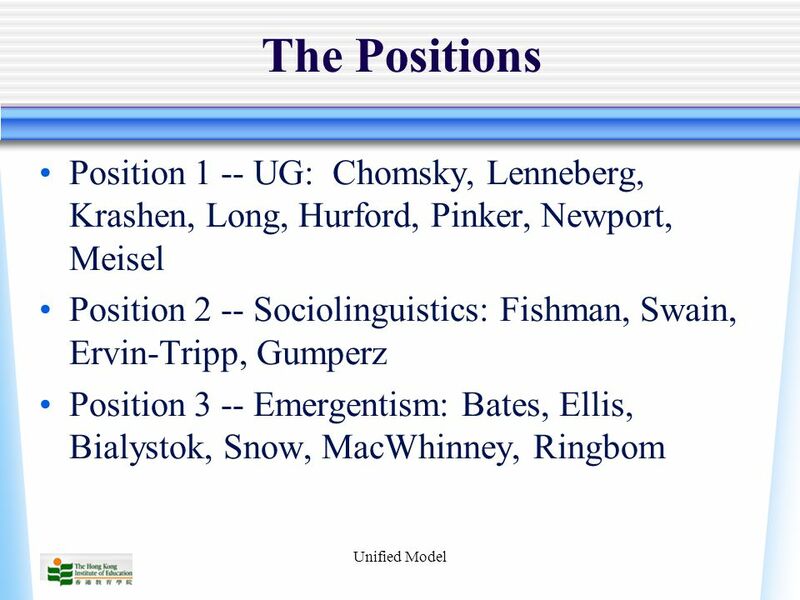 of Linguistics. 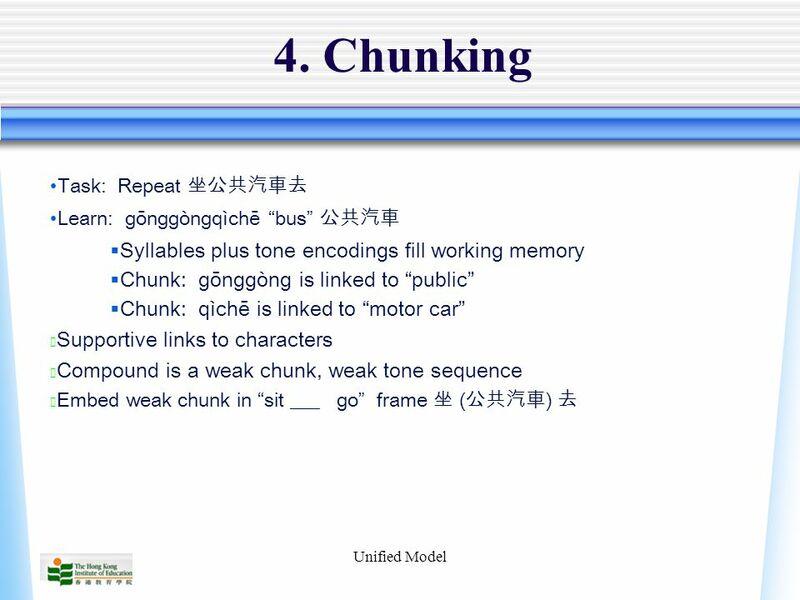 Memory and Working Memory An introduction. 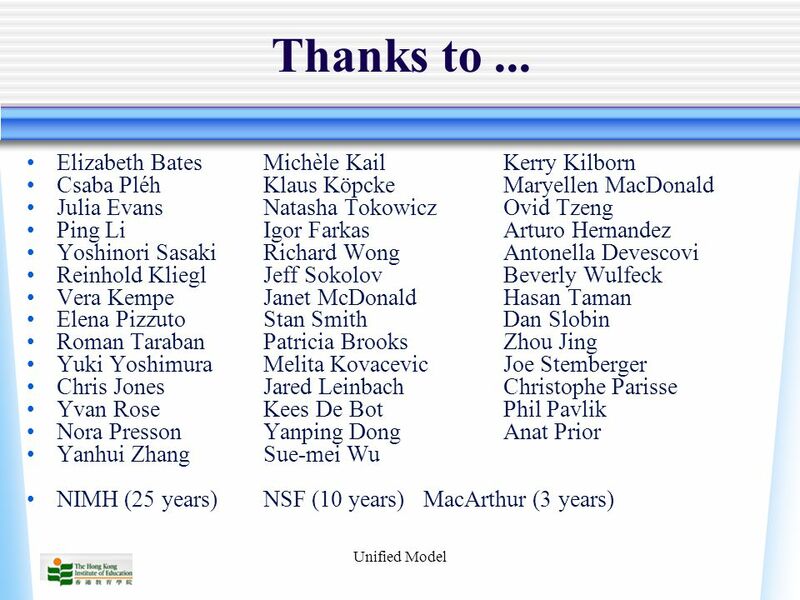 What have you forgotten? 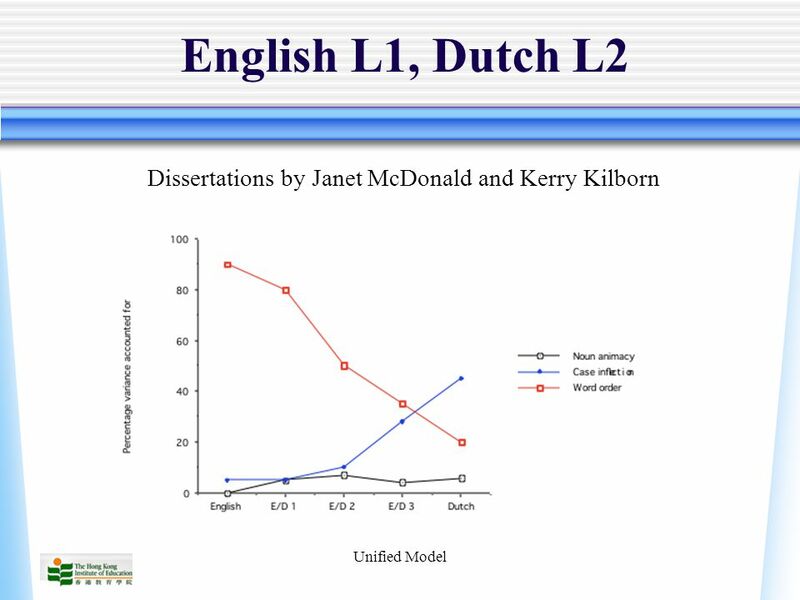 1 Language and kids Linguistics lecture #8 November 21, 2006. 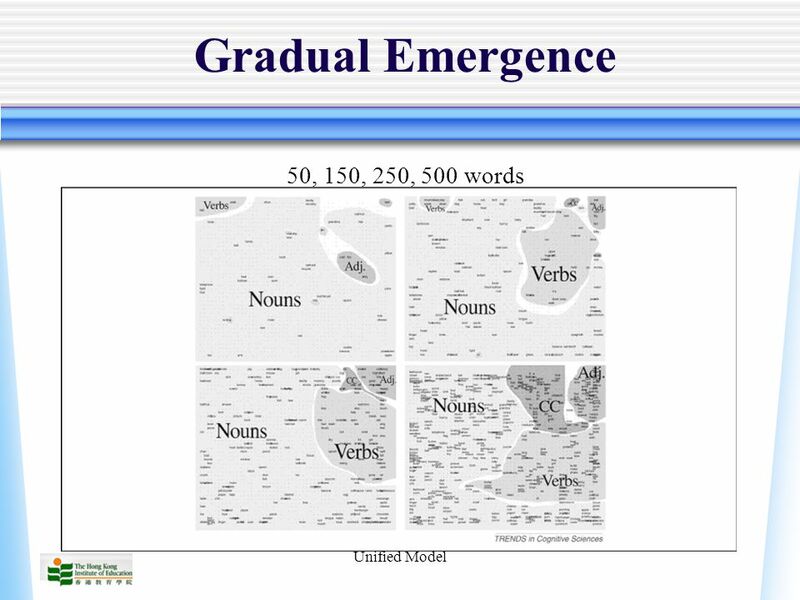 GRDG526: Language, Literacy, and Diversity in American Education Multilingual Learners Dr. Gloria E. Jacobs. 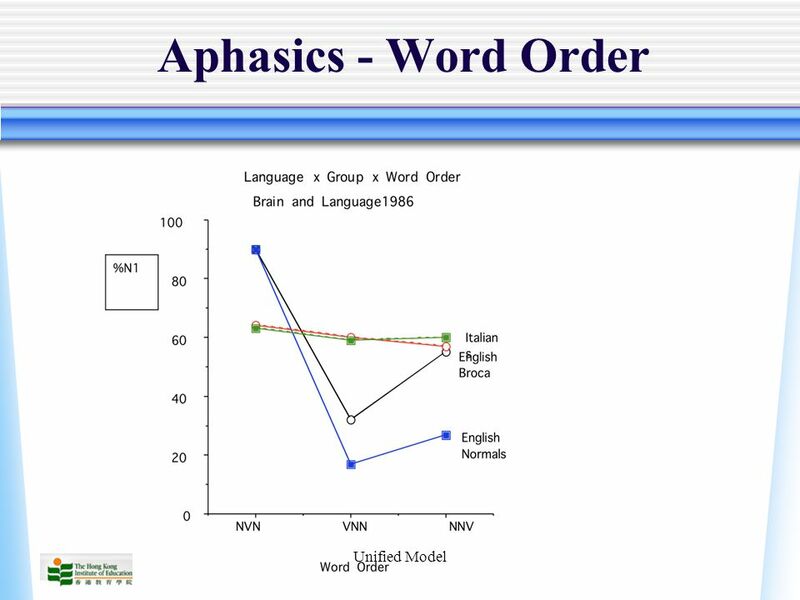 THE EFFECTS OF EARLY FOCAL BRAIN INJURY ON LANGUAGE AND COGNITION: Plasticity and Development Newborn Adult Brodmann,1909. 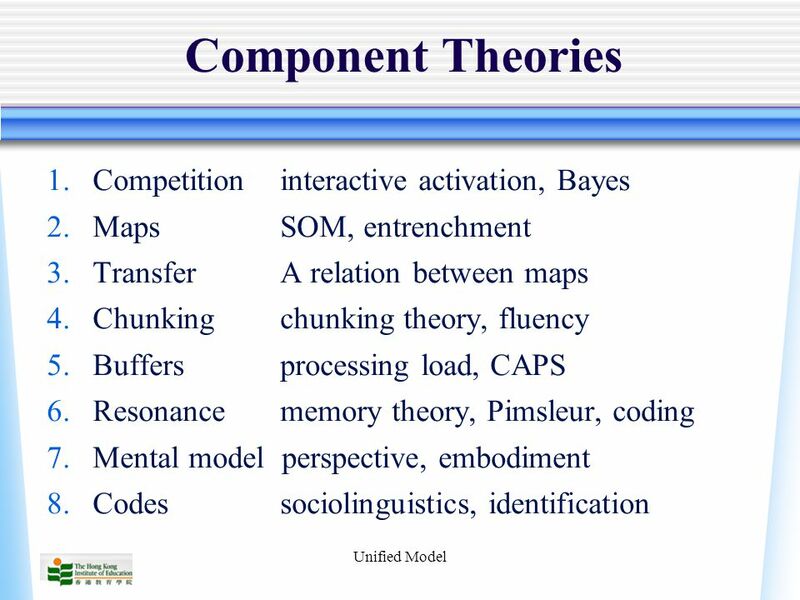 Theories of first language acquisition. 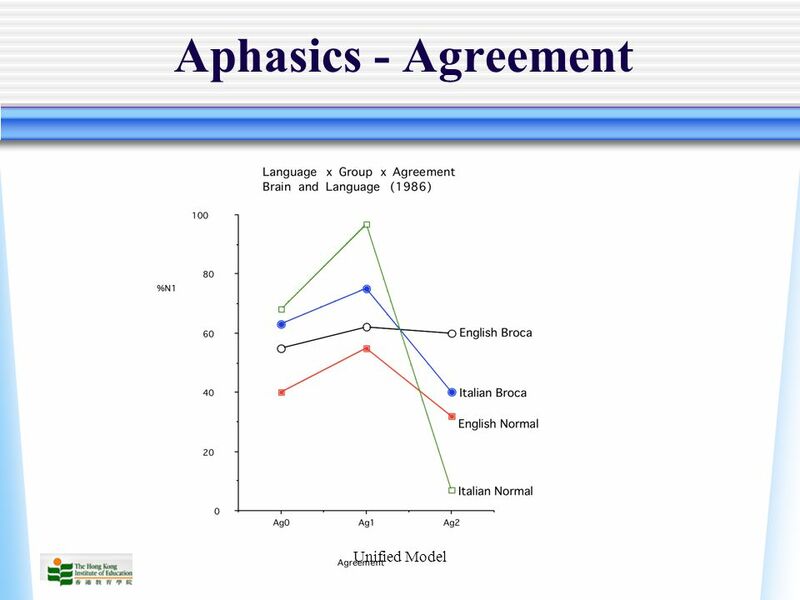  We are not born speaking! 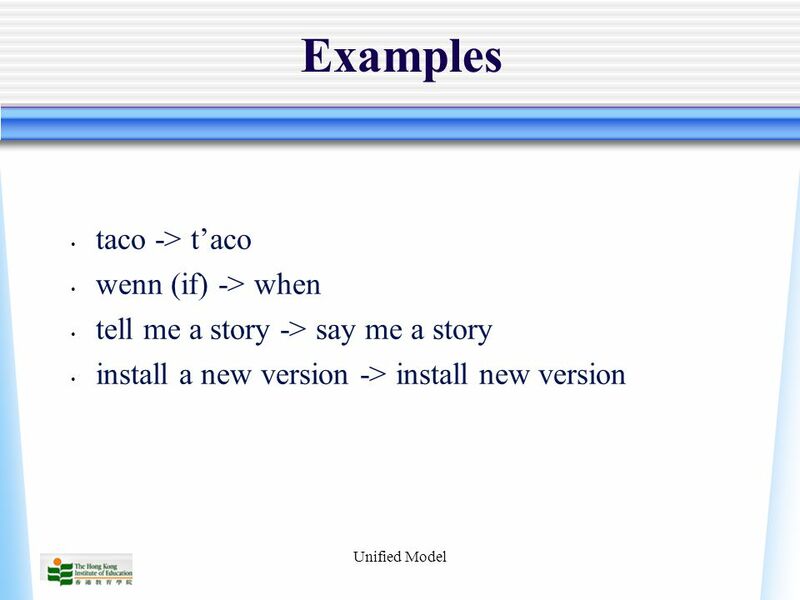  Language must be acquired. 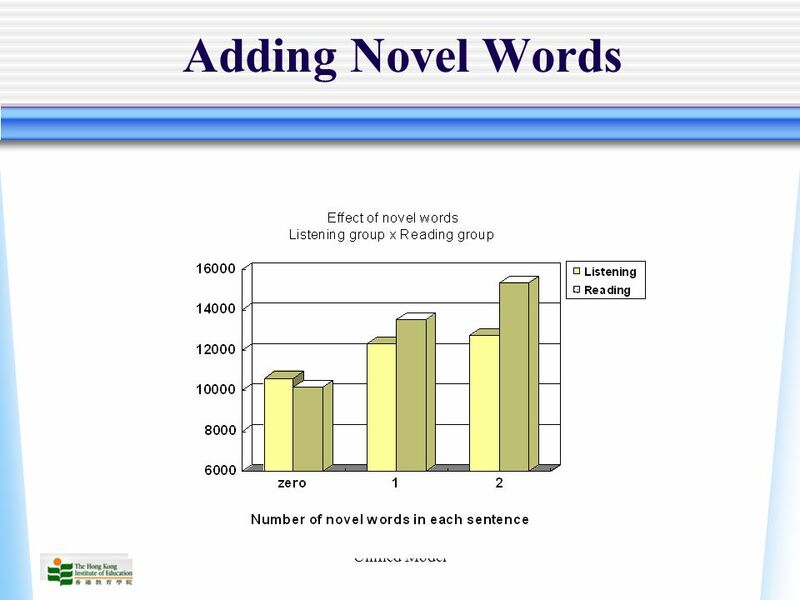 ◦ Learning vs. acquisition  If we think of all that.